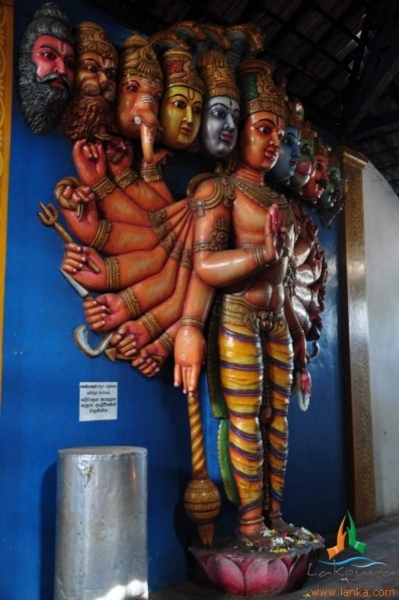 The great Hindu epic Ramayana, tells of the conquest of Sri Lanka in 3000 BC by the Hindu god “Rama” who fought with the demon king “Ravana” in Sri Lanka to rescue his wife “Sita”. 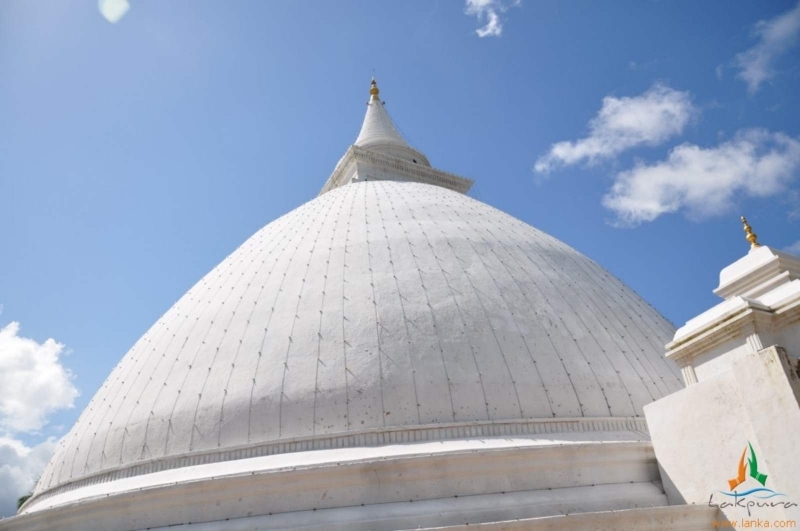 Today Sri Lanka offers the opportunity to visit the many sites believed to have been part of the great Ramayana which include amongst others, Ravana’s fort, the Sita Amman temple where Sita was held and the Ritgala medicinal forest amongst others. 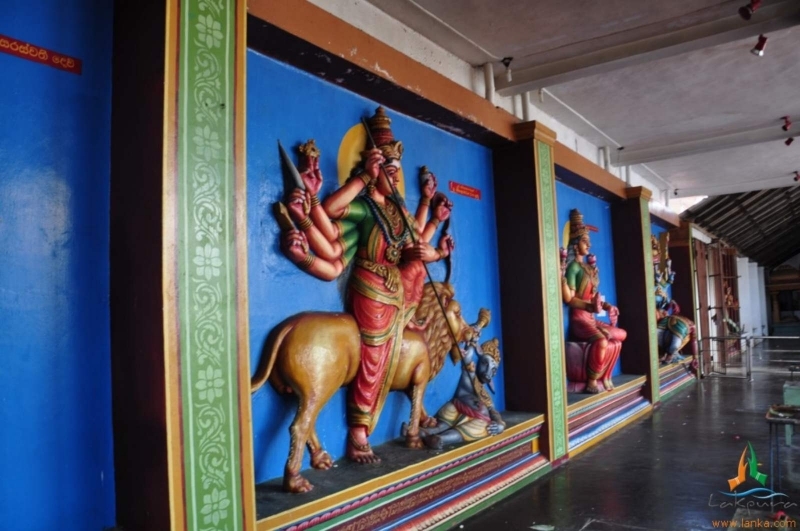 For over thousands of years, the Ramayana, epic of Asia, has had an unshakeable hold on the beliefs of vast multitudes of Asia’s teeming millions. 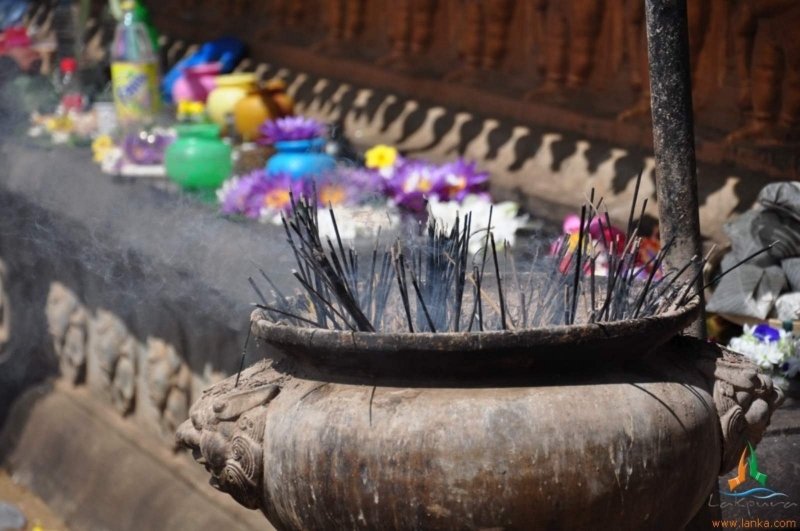 As diverse span of humanity as Kashmiri pandits and Cambodian fishermen, it is the universal heritage of all humanity. 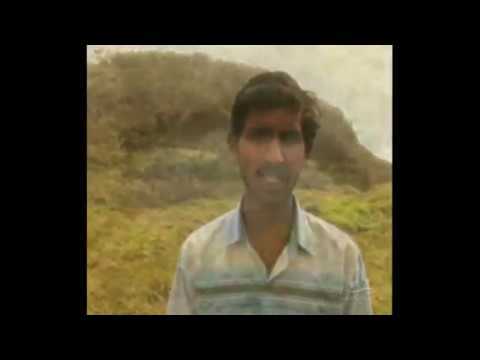 Emerging from the mists of the forested banks of India’s northernmost rivers, the crown jewel of a rich oral tradition, the song of Valmiki has become a pillar of principles, a symbol of the victory of good over evil, and a metaphor for the battle between the forces of light and darkness within every human soul. 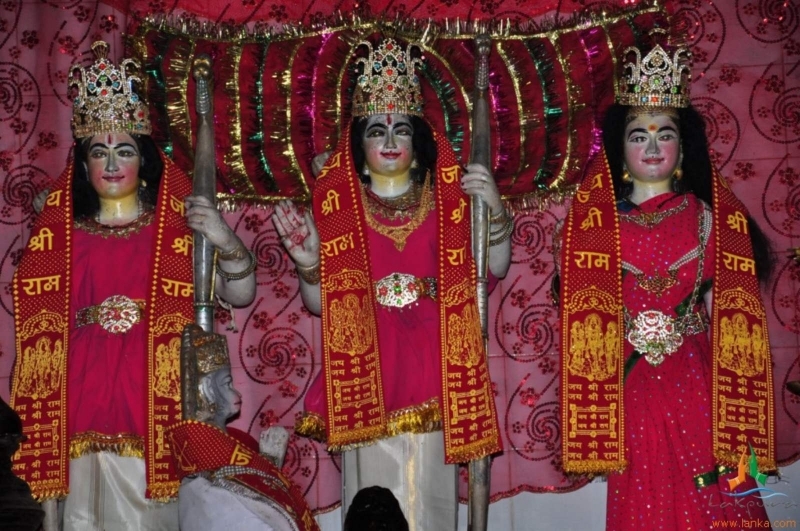 The legend of Rama, Prince of Ayodhya, where the darkly handsome prince in exile, unswervingly confronts and overcomes fearsome odds in the form of the mightiest demon-king of his time and the heartbreaking injustices of court intrigues, with equanimity and generosity in thought and action, has also left behind a rich legacy of sites and temples in the country where the most significant events of this epic took place – Lankapura – Sri Lanka. 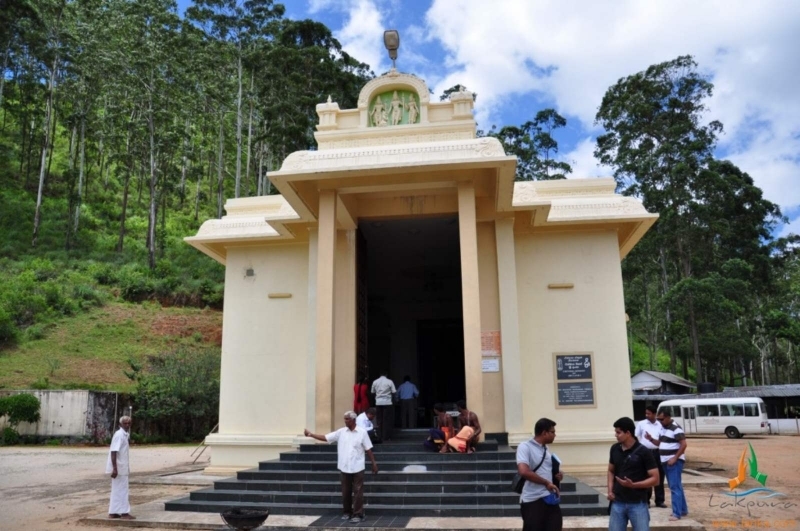 Sri Lanka is the proud custodian of more than 50 Ramayana sites from the place of Seetha Devi’s captivity to the battlefields where vast armies clashed, to the groves of exotic herbs dropped by the monkey god Hanuman, to the ultimate theatre of war where Lord Rama slew Ravana, the ten-headed demon-king. 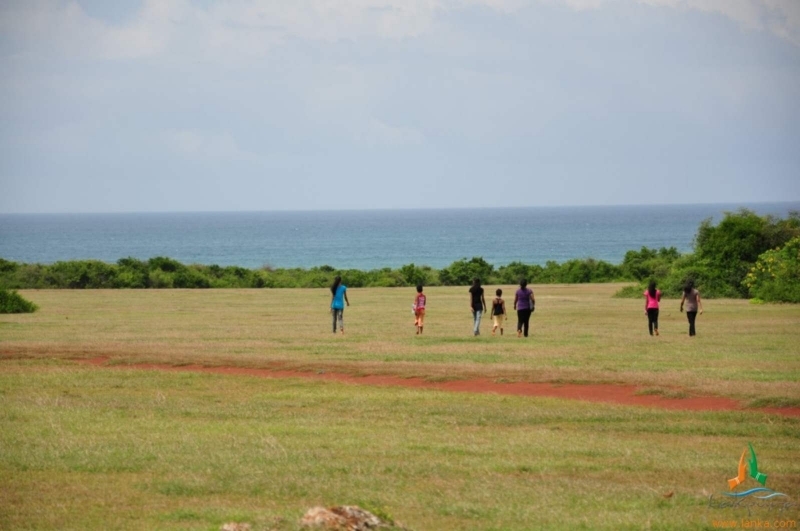 People living in the areas where great events took place, remember to this day the connection of their soil to the great epic. 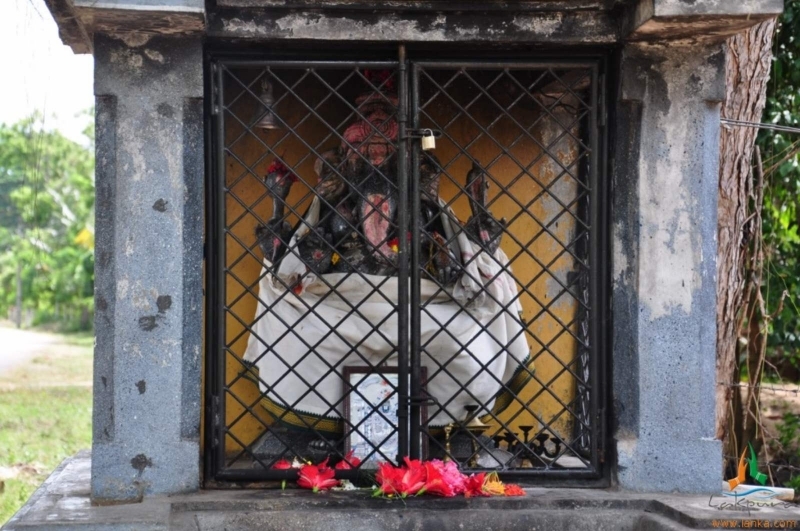 An oath taken at the spot where Seetha Devi undertook ‘Agni Pariksha’ is still considered valid in village courts or grama sabhas. 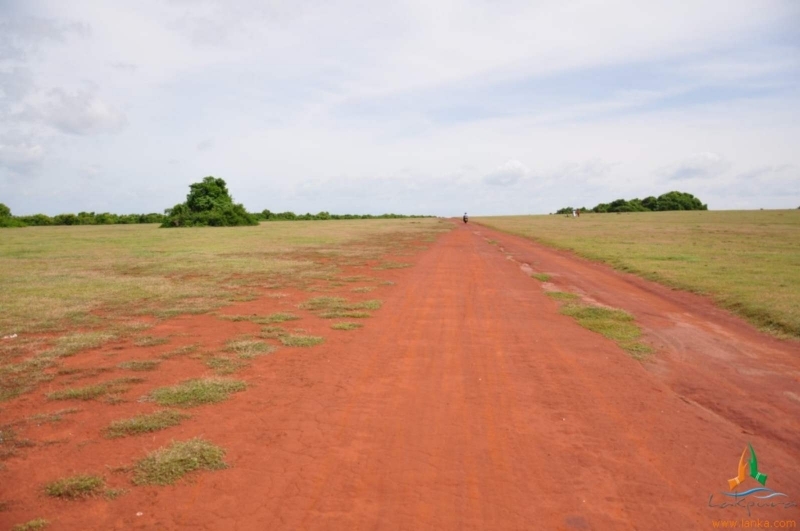 The colour of the soil of the ancient battlefield is still red today, and is still surrounded by lighter coloured earth. 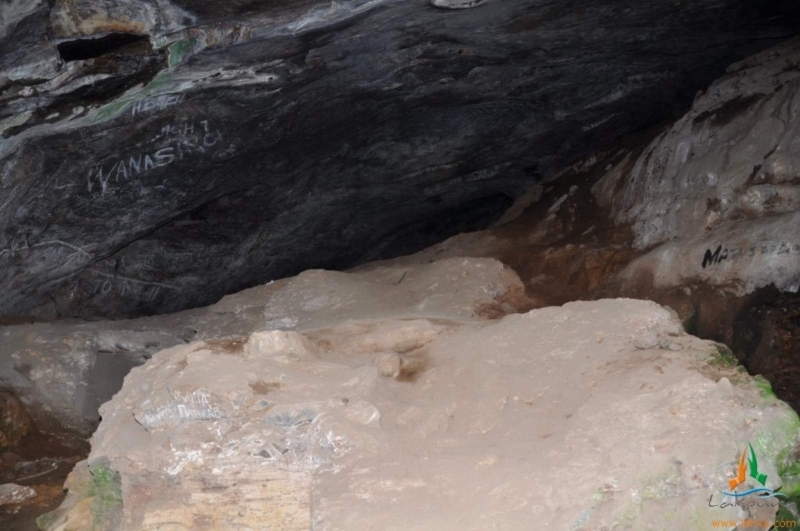 One of the airports of Ravana, torched by Hanuman when he came looking for Seetha Devi, still has a scorched-earth look. 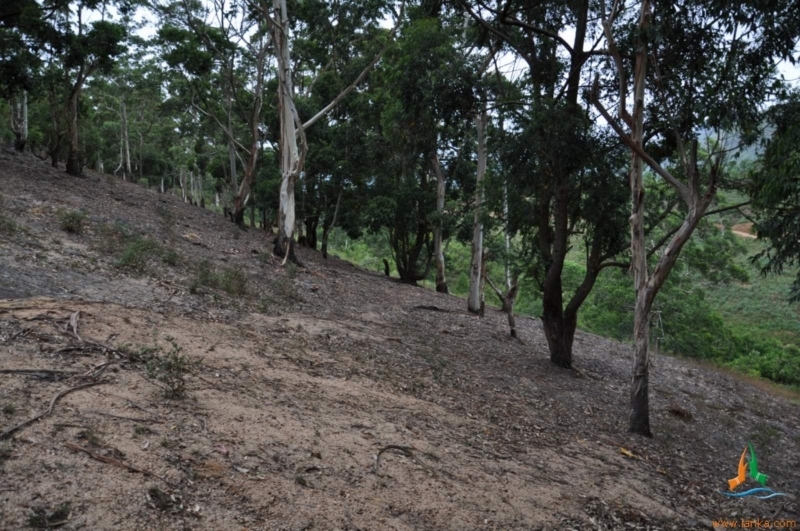 A patch of darker soil surrounded by brown earth. 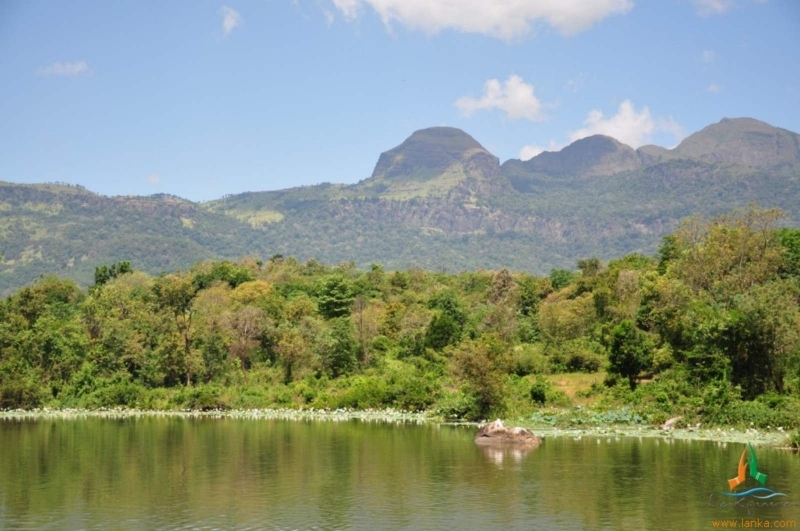 Exotic alpine Himalayan species are found suddenly amidst tropical Sri Lankan vegetation, the legacy of Hanuman’s heroic voyage carrying a mountain with life-restoring herbs. 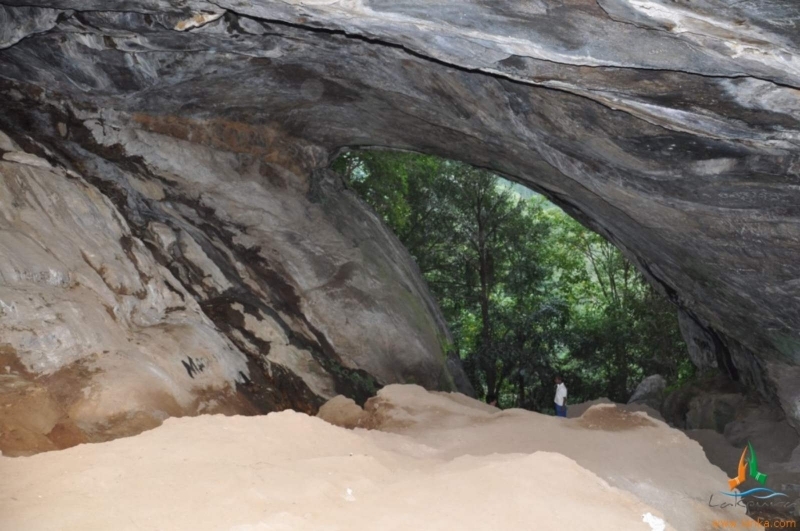 Incredibly, the names of places have come down to modern times unchanged. 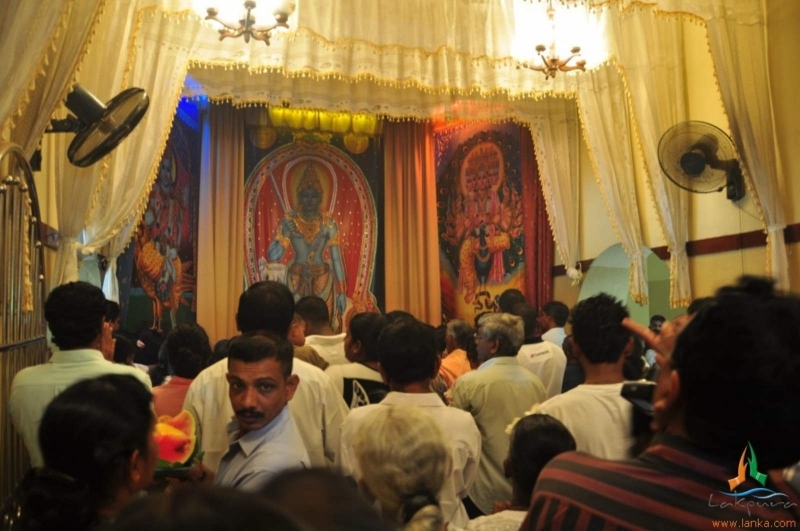 Though great social, cultural and religious changes have taken place in Sri Lanka since. 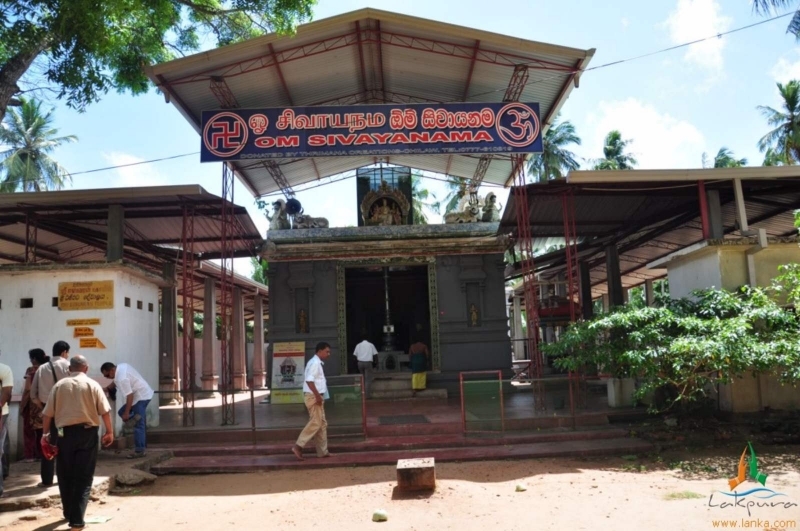 This is the first Anjaneyar Temple in Sri Lanka and also the only Panchamuga (five faced) Anjaneyar Temple in Sri Lanka. 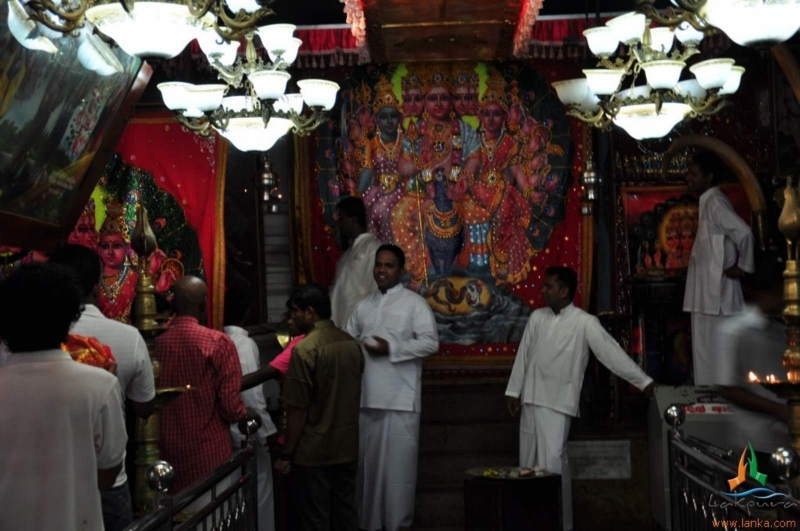 Its the only temple in the world to have a chariot for Ajanyear. 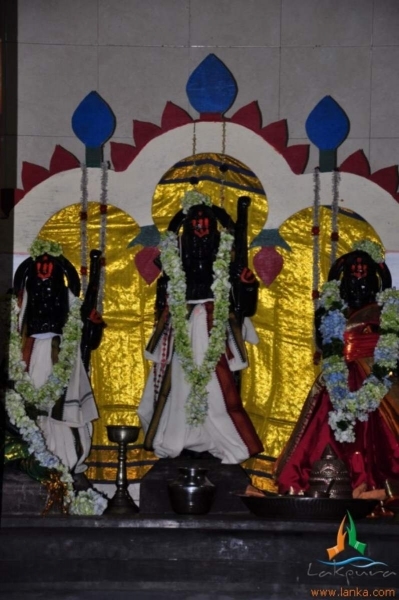 The chariot festival is held annually end Dec/ beginning of January. 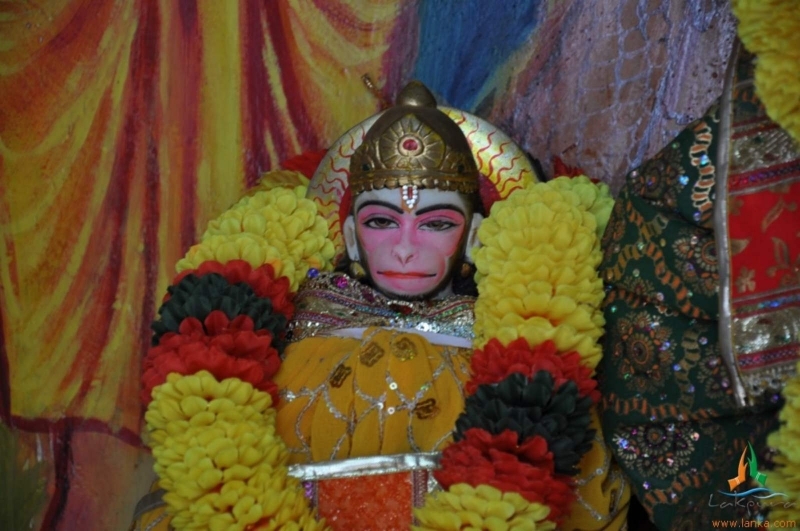 Hanuman’s mother is Anjan. 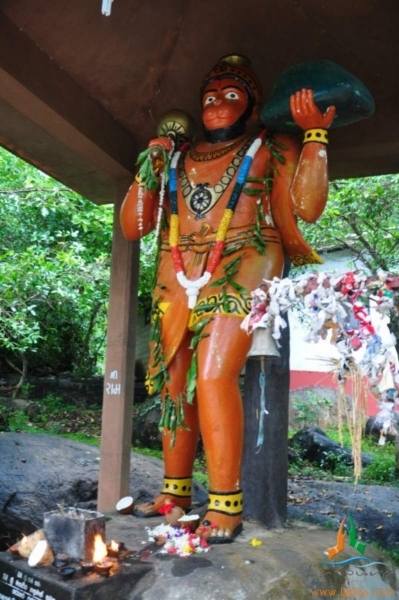 Hanuman is known as Anjan + Aiyar = Anjaneyar in South India (Hamuman in North India). 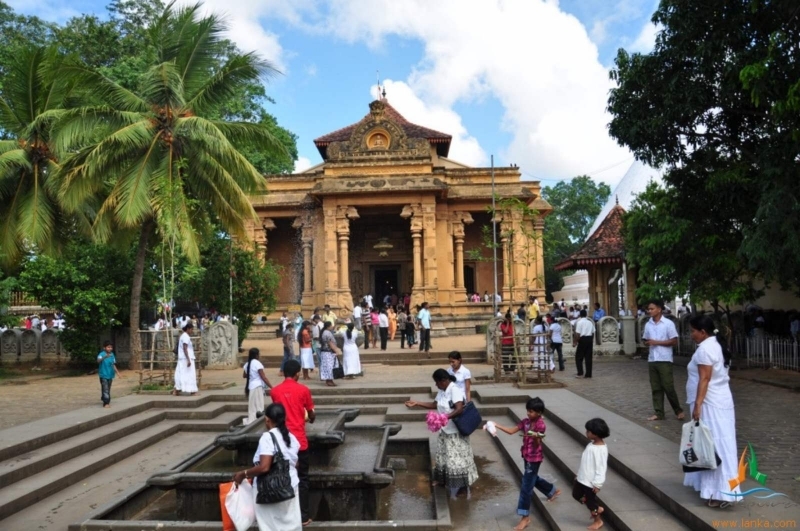 Kelaniya is the closest site to Colombo connected to the Ramayana. 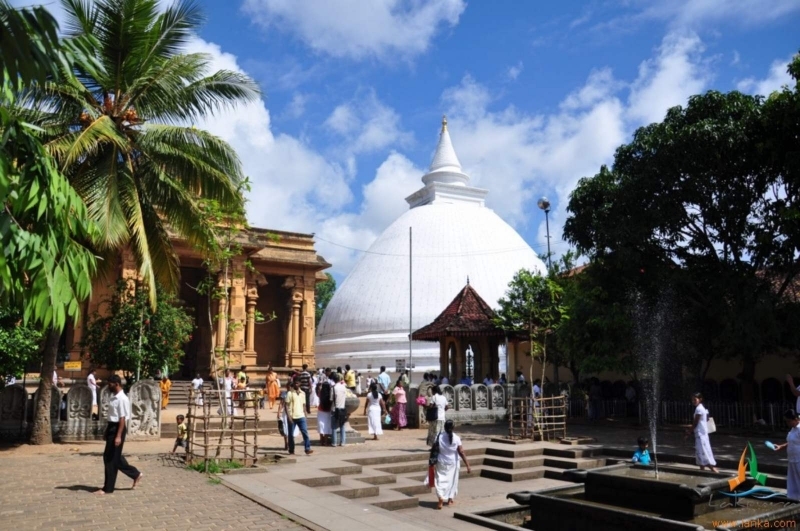 After King Ravana’s death, Vibeeshana was coroneted as King of Lanka by Lakshmana at Kelaniya. 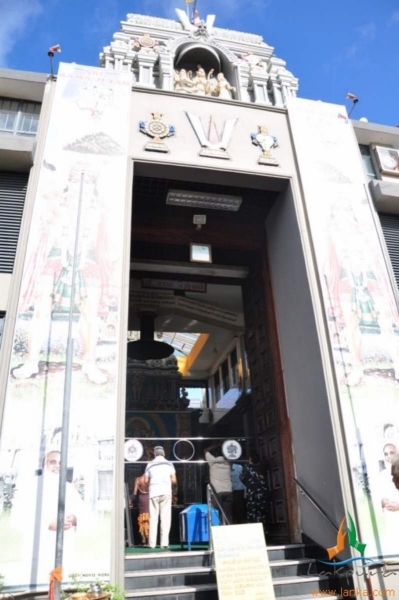 There are murals enshrined outside the Buddhist temple depicting the crowning of Vibeeshana. 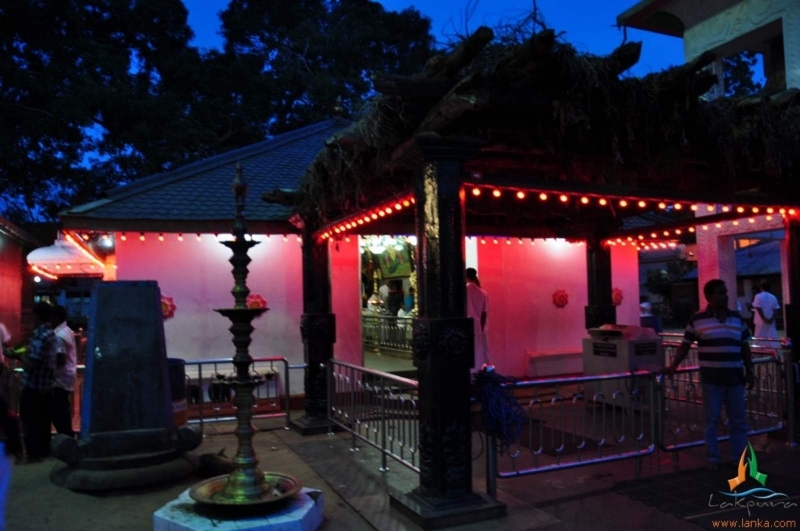 The Kelani River is mentioned in the Valmiki Ramayana and Vibeeshana palace was said to be on the banks of this river. 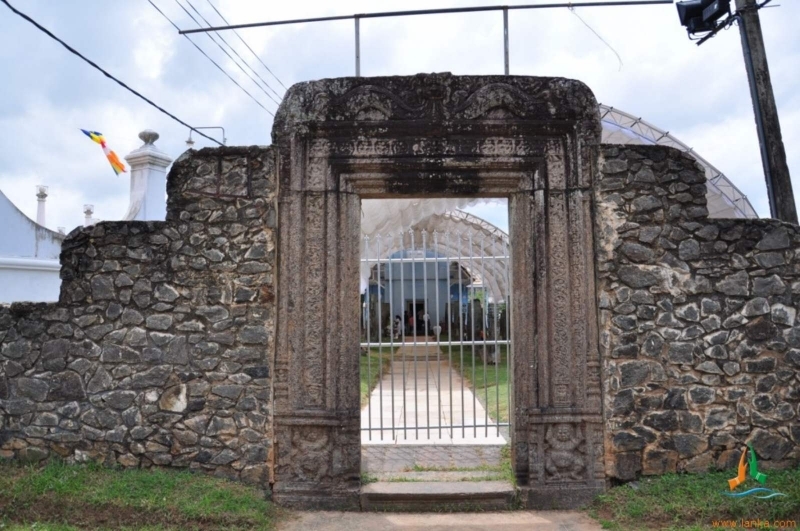 The reason Lakshmana crowned Vibeeshana, was Kelaniyabecause Rama had to return to India as he had to continue his self-exile of 14 years to honour the commitment to his father, King Dasarath of Ajodhya. 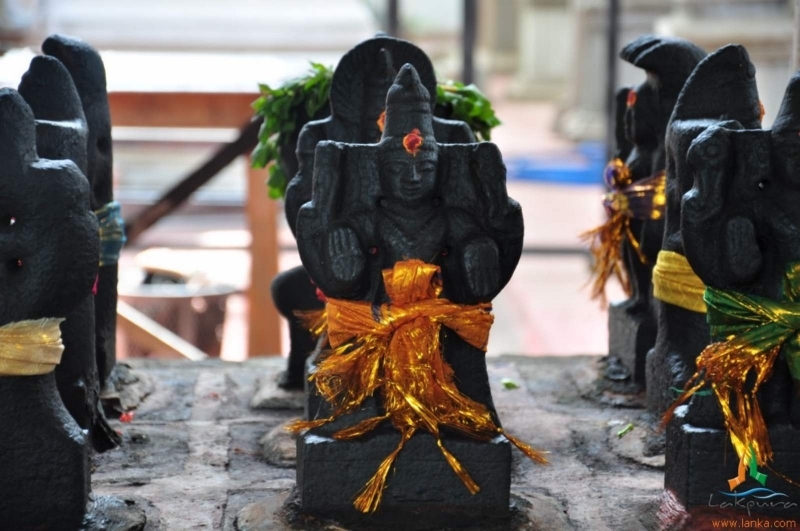 King Vibeeshana was considered a fair king, as he supported Rama against his own brother’s injustice. 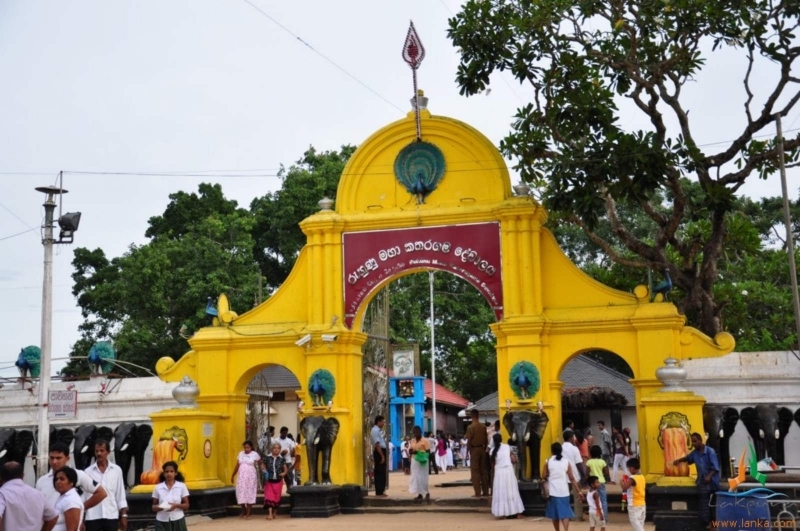 Many devotees that visit king Vibeeshana’s shrine pray to him asking his intervention to a fair recourse to their problems. 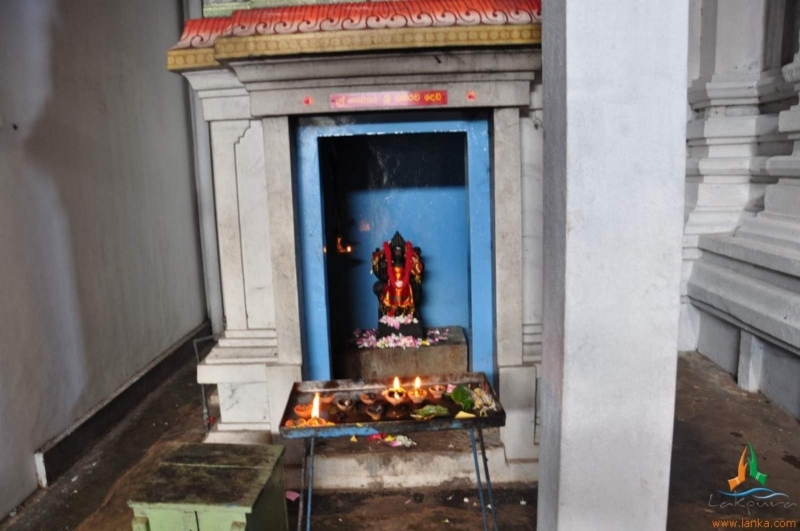 Manavari is the first lingam installed and prayed by Lord Rama and till date this lingam is called as Ramalinga Shivan. 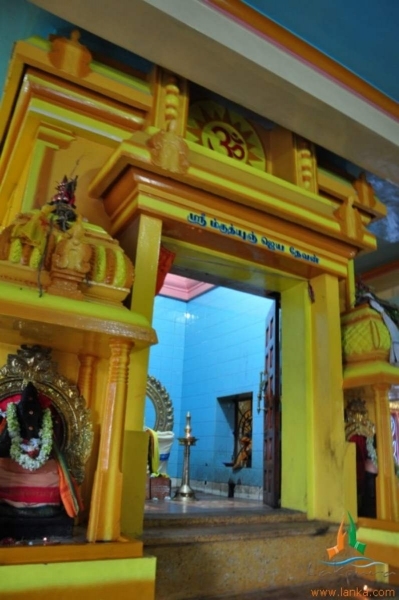 Rameshwaram is the only other lingam in the world named after Lord Rama. 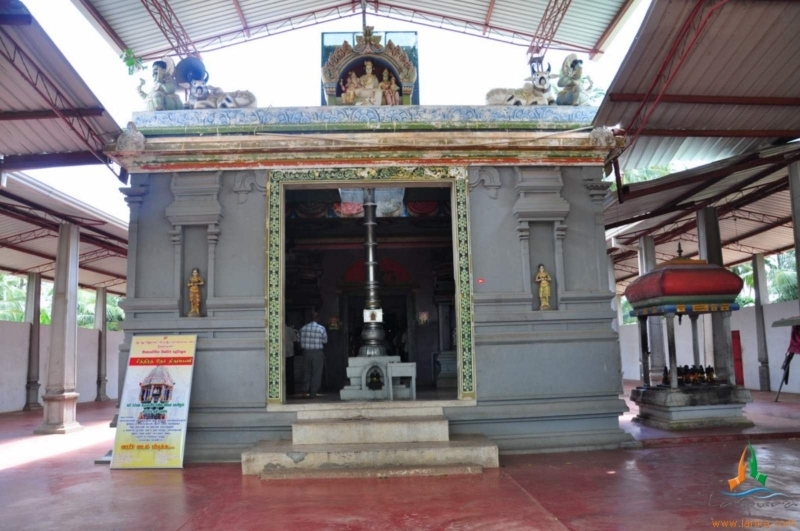 It is believed that Munneswaram predates the Ramayana and a temple dedicated to Lord Shiva was located here. 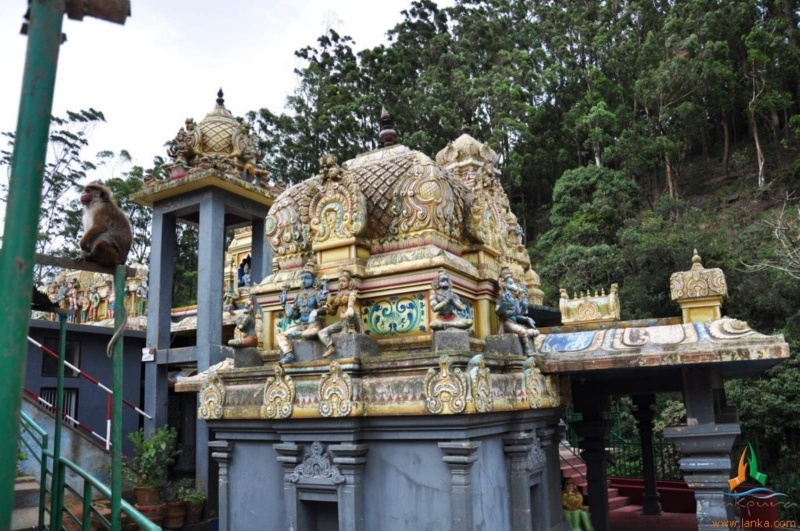 Munneswaram means the first temple for Shiva (Munnu + Easwaran). 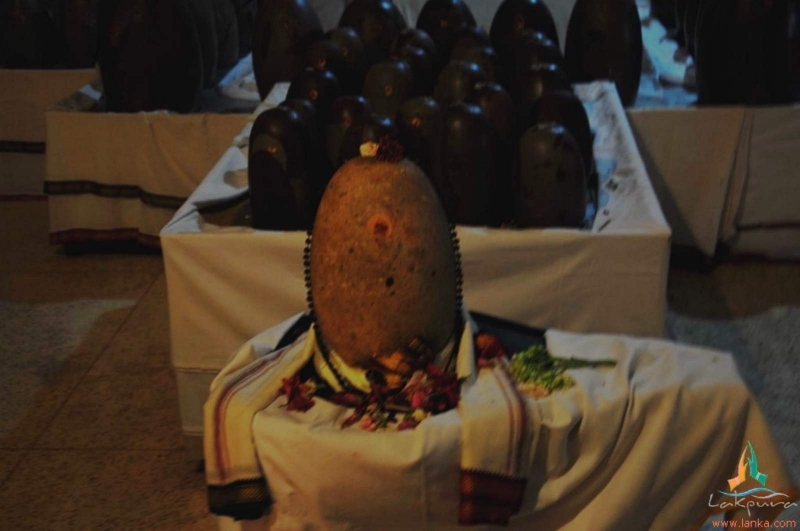 A Shiva Lingam was already here when lord Rama visited the place. 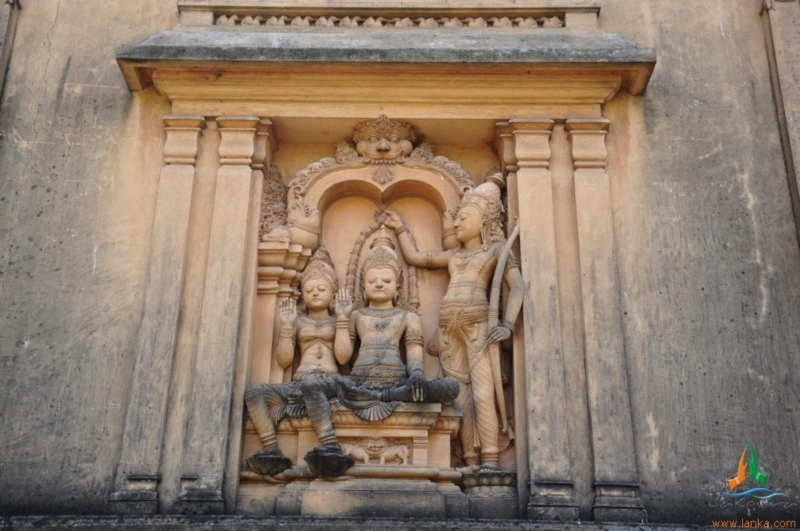 Lord Rama after his victorious battle left for Ayodhya with Sita in one of King Ravana’s vimanas. 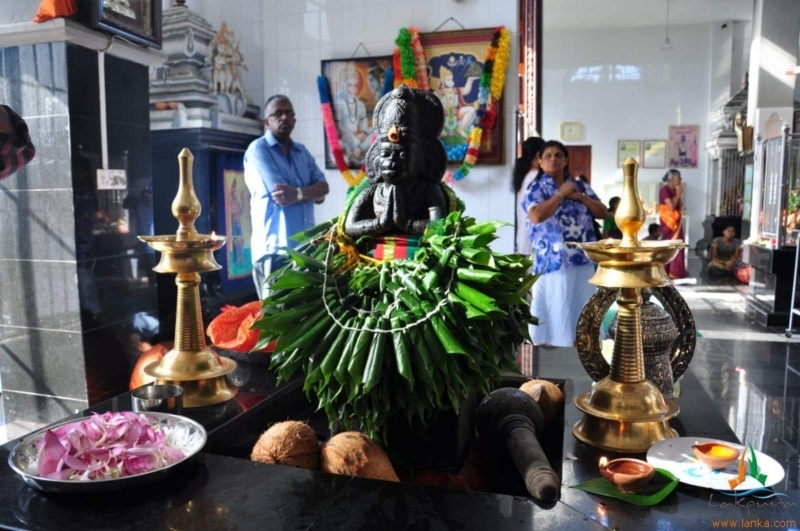 He felt he was being followed by Bramhaasthi dosham (a malevolent black shadow) as he had killed King Ravana who was a Brahmin. 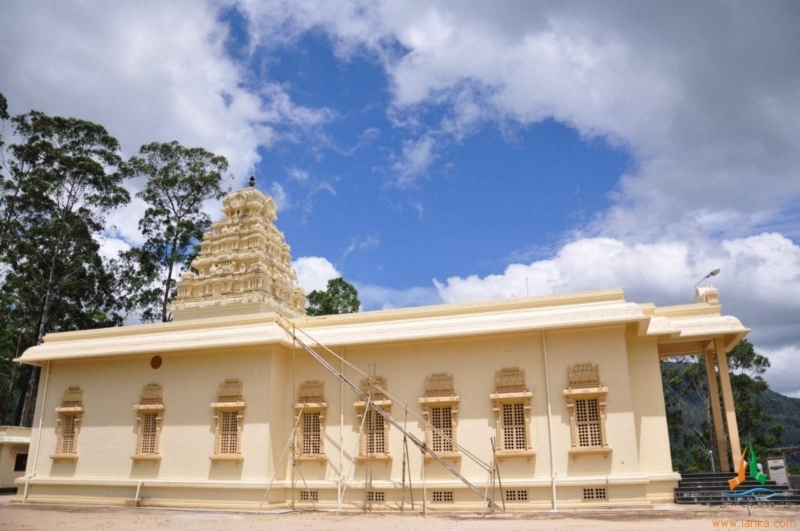 When the Vimana was passing over Munneswaram, he felt the vimana vibrating, and Muneswaramrealised the “Brahmaasthi Dosham” was not following him at this particular point. 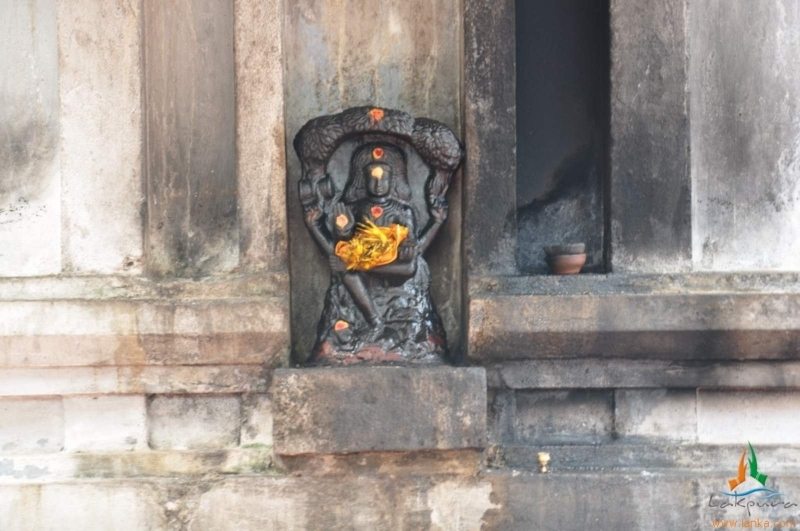 He stops the vimana at this juncture and asks God Shiva for a remedy. 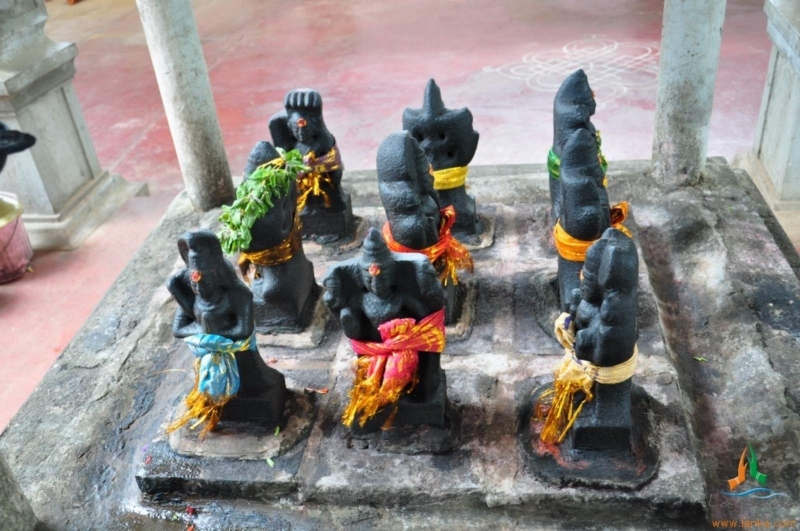 God Shiva blessed Lord Rama and advised installing and praying for four lingams at Manavari, Thiru Koneshwaram, Thiru Ketheshwaram and Rameshwaram in India, as the only remedy to get rid of the dosham. 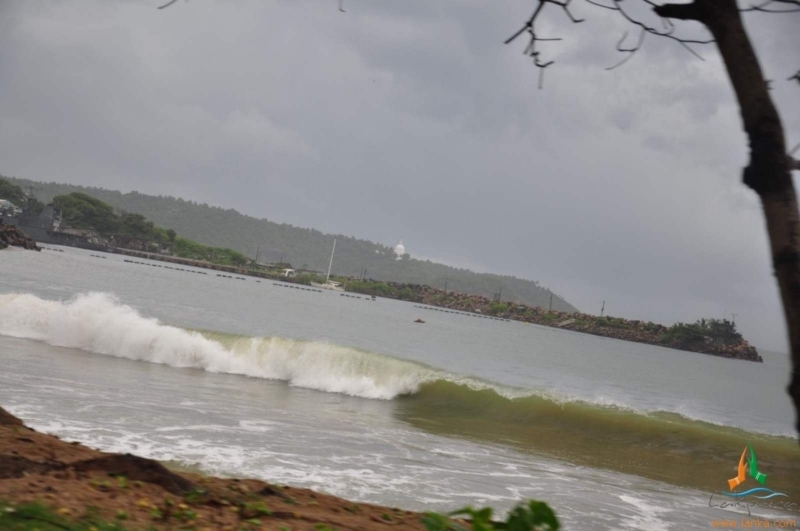 The first Lingam was installed at Manavari about 5 Km from here, near the banks of Deduru Oya. 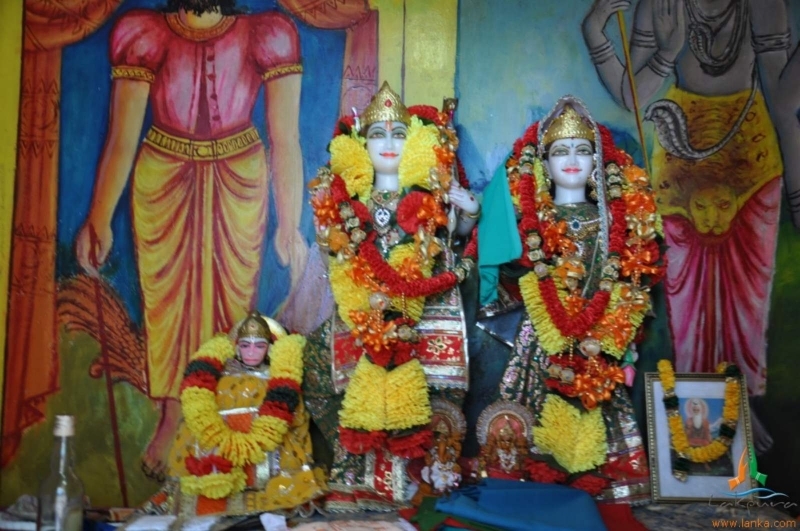 At different points of time during the war both Lord Rama and Lakshmana were hit by powerful arrows, fell unconscious and to bring them back to life Lord Hanuman was instructed to fetch the life saving herbs from Himalaya. 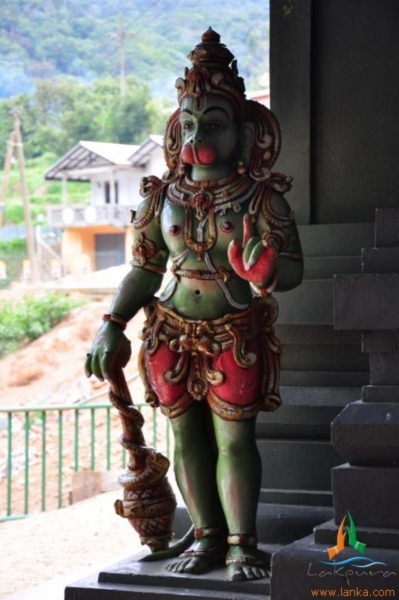 Hanuman went to the hill, lifted the whole hill and brought it, as he was not able to identify the life saving herbs alone. 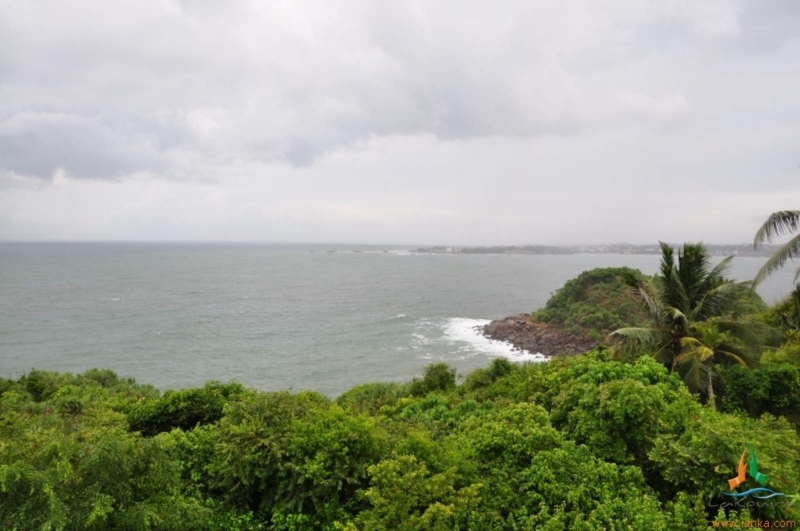 Parts from the hill fell on five places in Sri Lanka, namely, Rumasala in Galle, Dolu Kanda in Hiripitiya, Ritigala on the Habarana Anuradhapura road, Thalladi in Mannar and Kachchativu in the north. 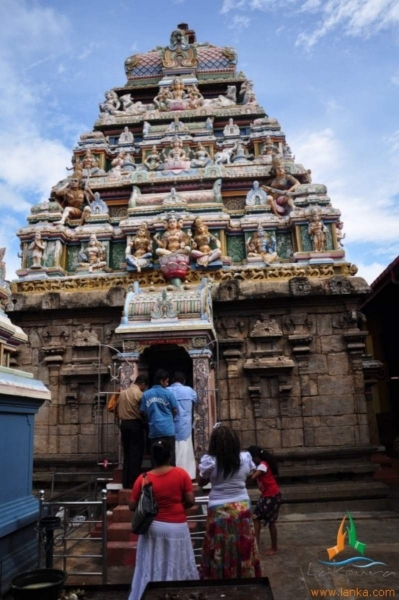 There are a few Rama temple in Sri Lanka, this is one of them. 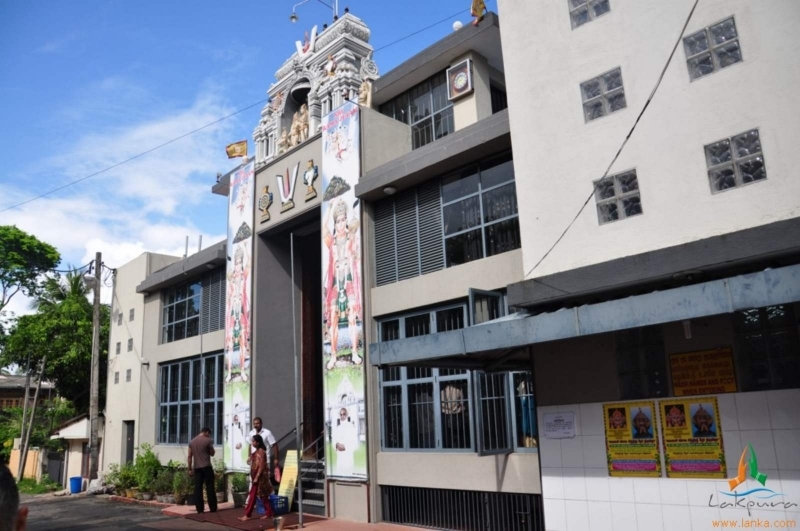 This is the only Rama temple in this area. 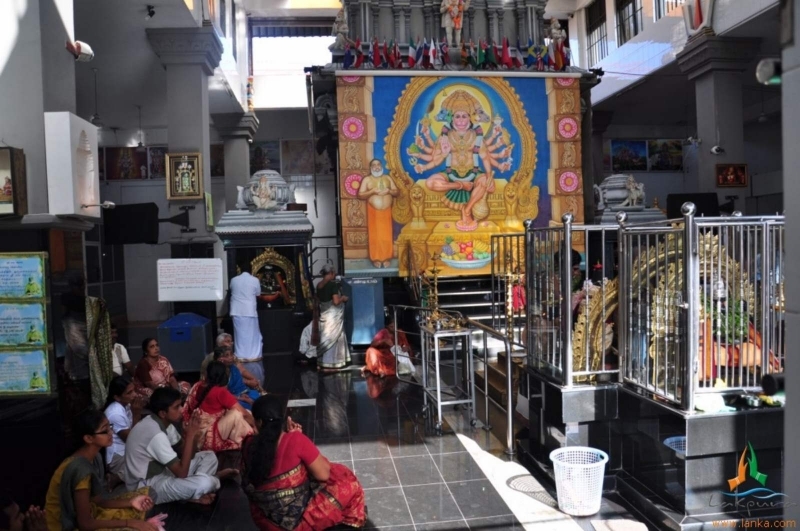 This is a privately managed temple. 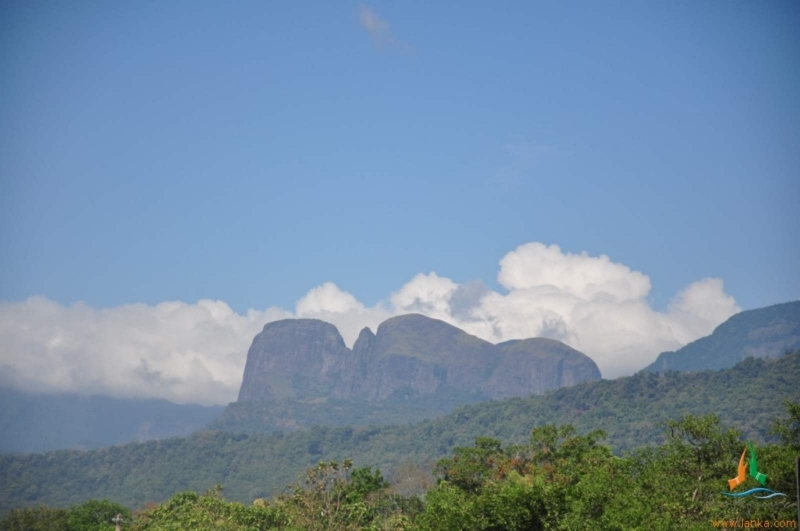 This is one of the most scenic routes to travel from Matale to visit Laggala (on the northern side of Knuckles). 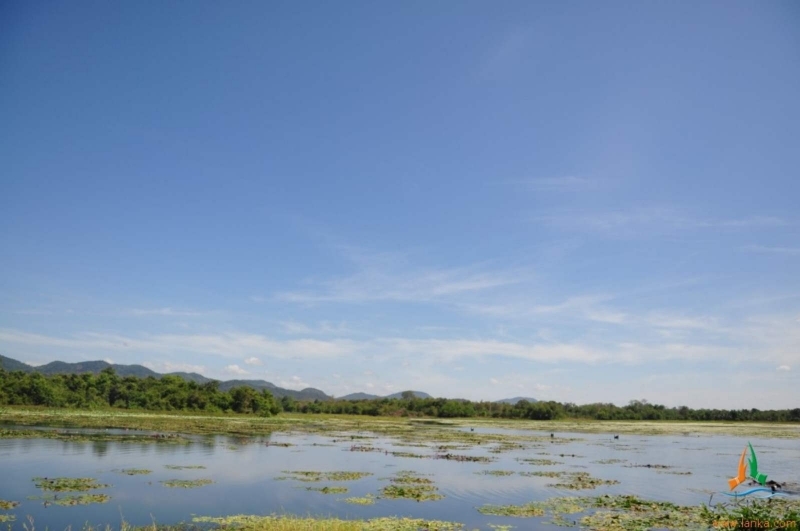 The cartels behind the Dunuvila lake are called Laggala. 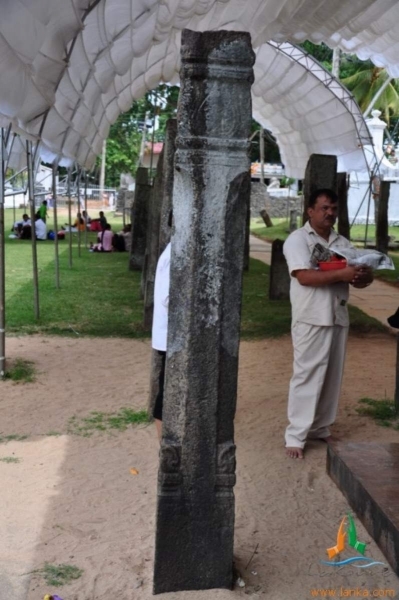 Laggala is derived form the Sinhala term Elakke Gala, which when translated into English gives us the meaning Target Rock. 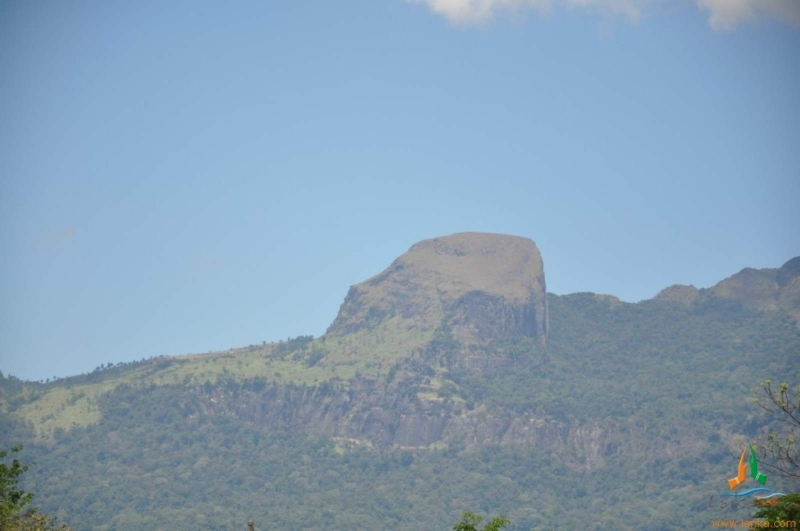 Laggala served as a sentry point to the King Ravana’s army and it was from this rock the first Glimpse of Lord Rama’s army was sighted and informed to King Ravana. 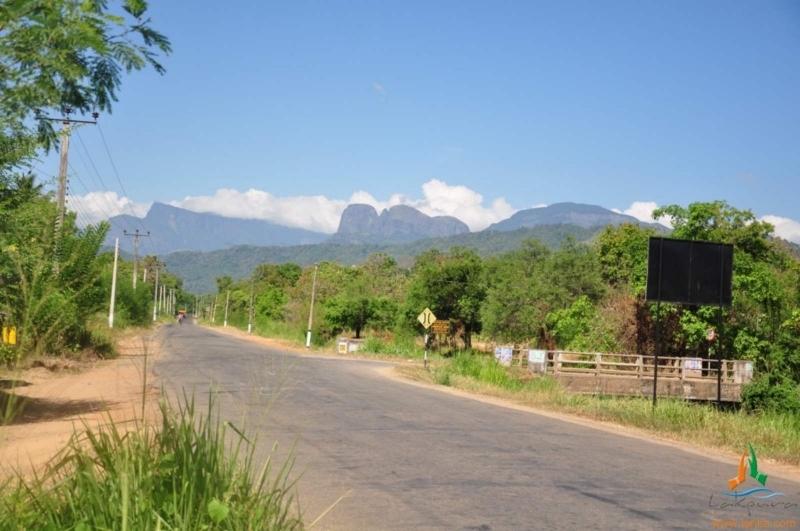 This hill is geographically the highest part of the northern region of King Ravana’s city and on a clear day the north east side that is Thiru Koneshwaran and north west side that is Talai mannar could be seen even today. 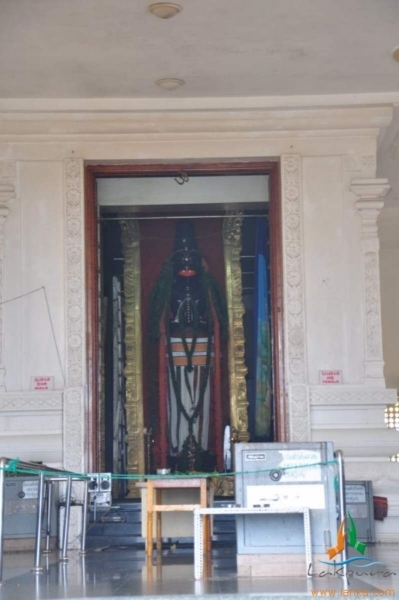 King Ravana is believed to have done meditation on this rock and prayed Lord shiva at Thiru Koneshwaran from this point. 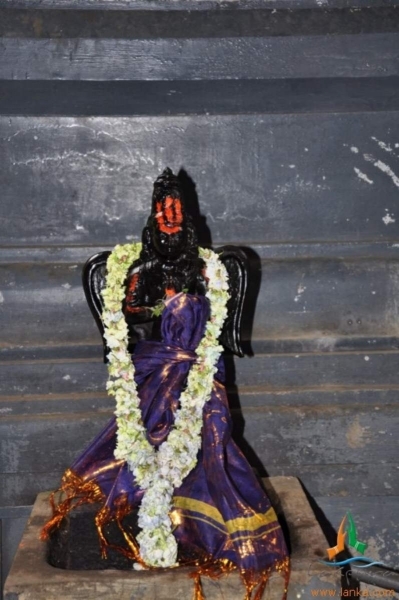 It is here that King Ravana was killed by Lord Rama’s Brahmaastharam. 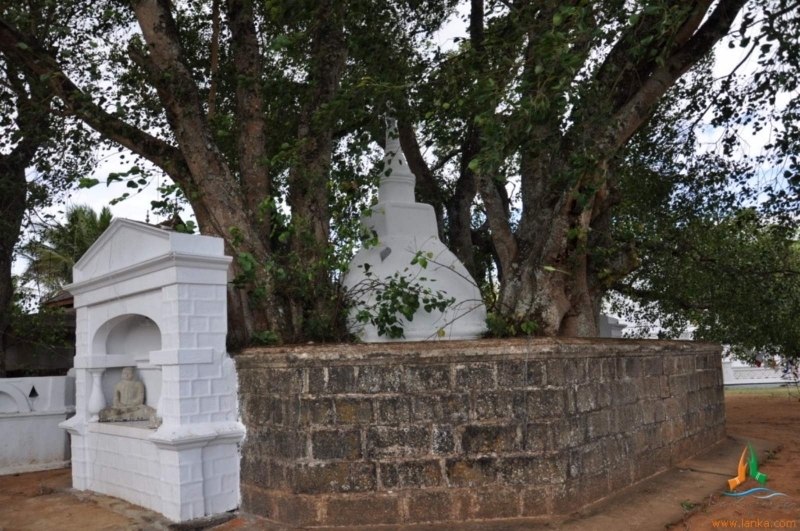 The top of Laggala is flat and is believed to have been hit by the Brahmaastharam. 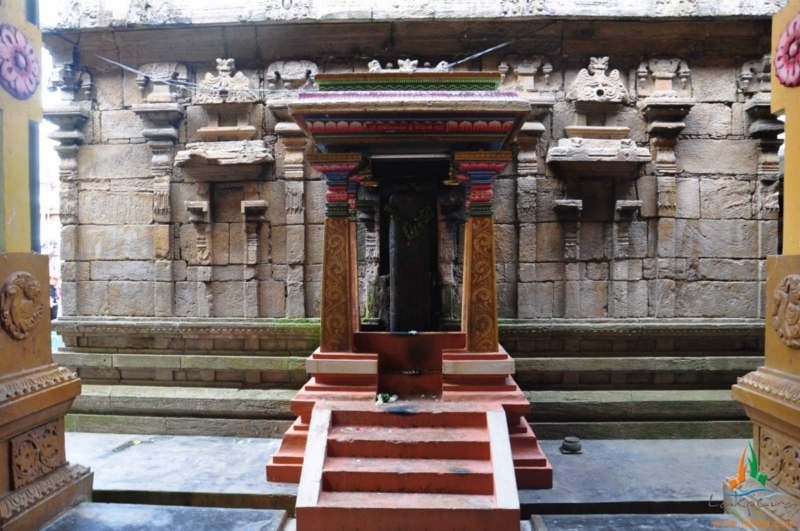 Dunuwilla is the place from where Lord Rama fired the Brahmaastharam at King Ravana, which eventually killed him. 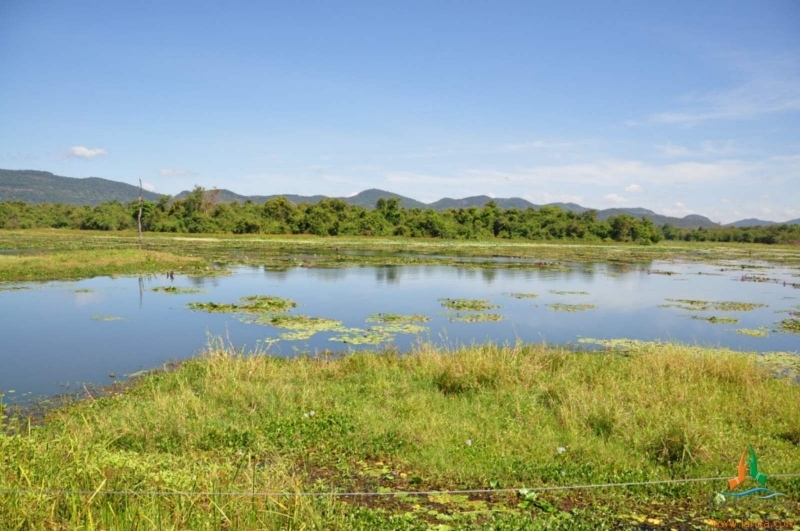 Dhunu means arrow and Vila Means Lake. 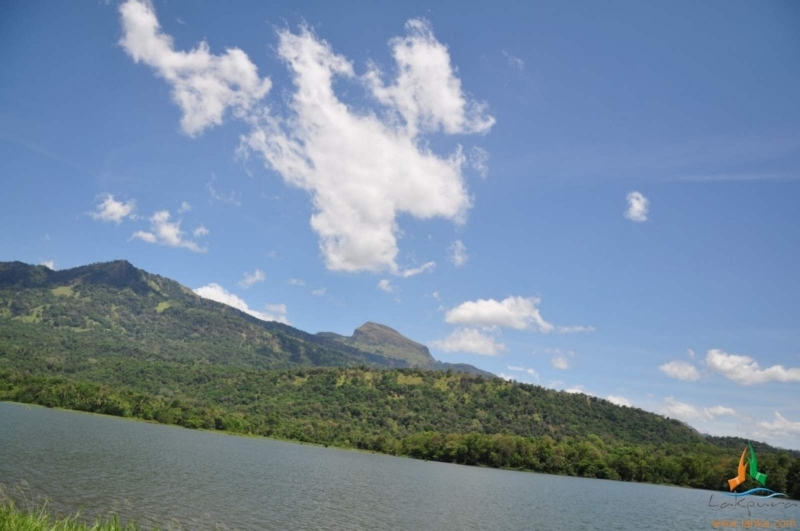 This place got its name because Lord Rama fired his arrow from this lake. 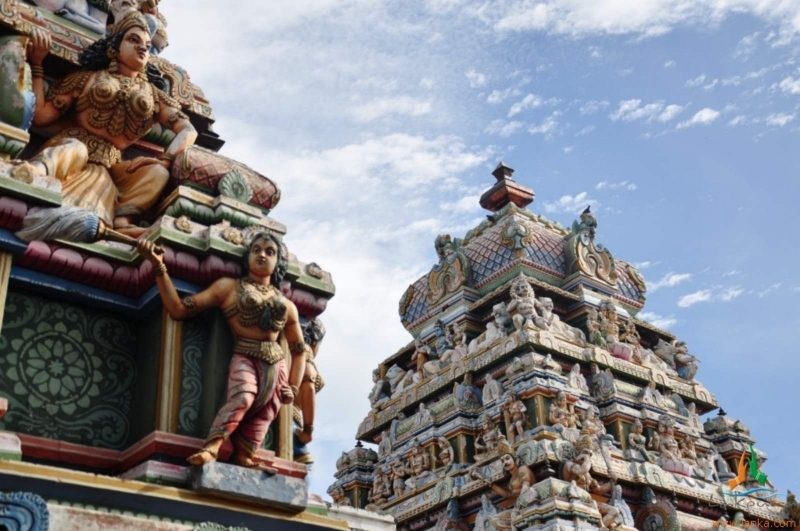 Kondakalai like many other cities and villages in Sri Lanka also derives its name from the Ramayana, when King Ravana took Sitadevi in a chariot to Ashoka Vatika her hairs got deranged because of the speed of the chariot. 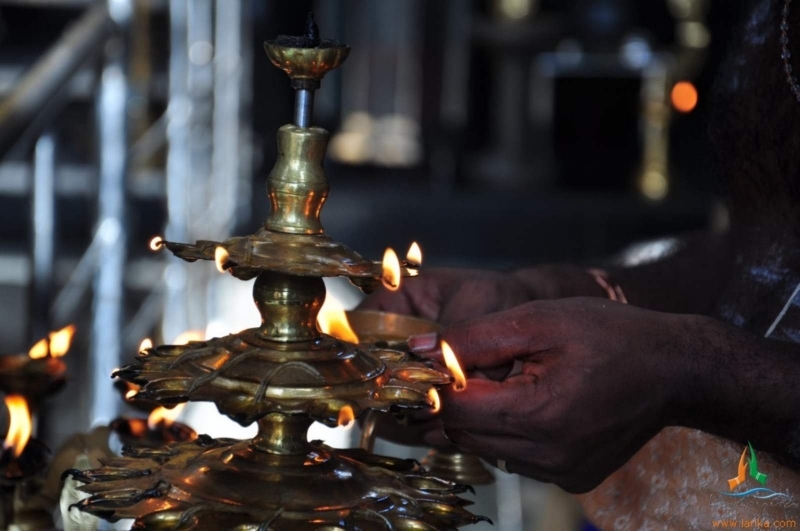 Konda kalai in tamil means deranging of hair. 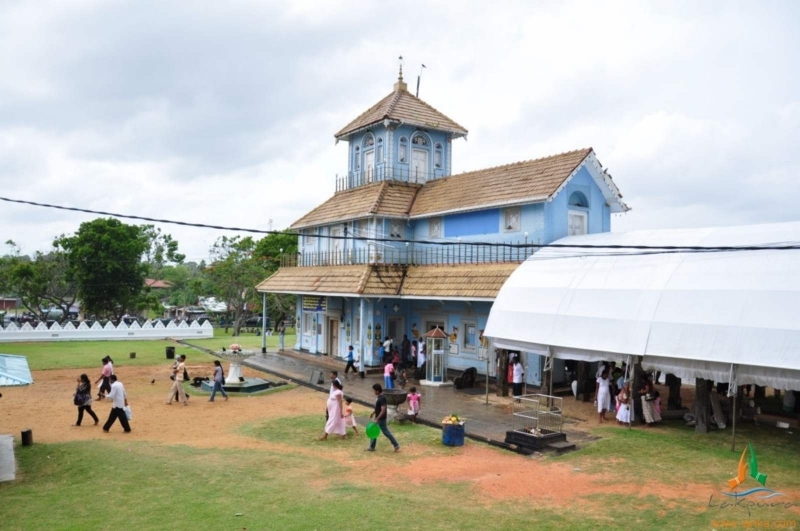 Till date the villagers live with legacy of this event. 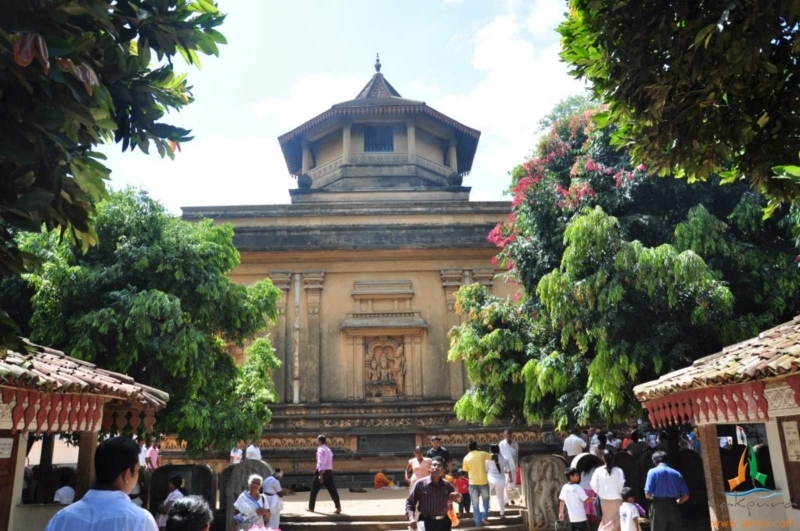 Sitadevi was kept in queen Mandothari’s palace until she was moved to Sita Kotua and then on to Ashoka Vatika. 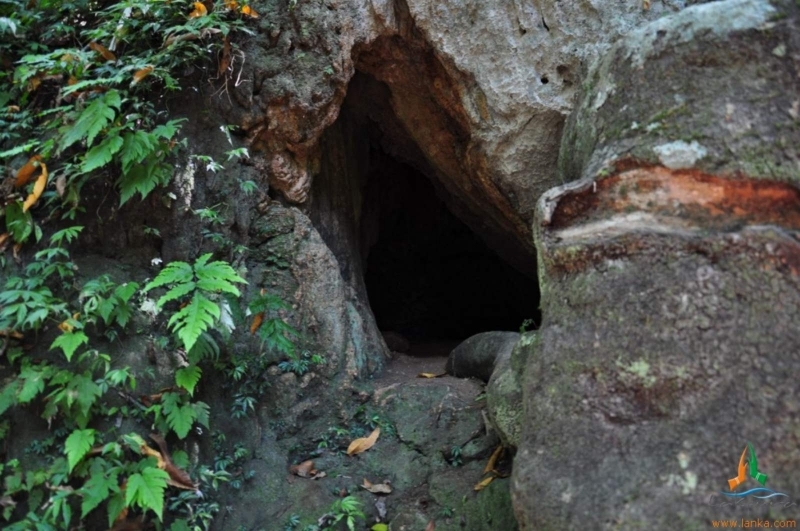 The remains that are found are the remnants of later civilizations. 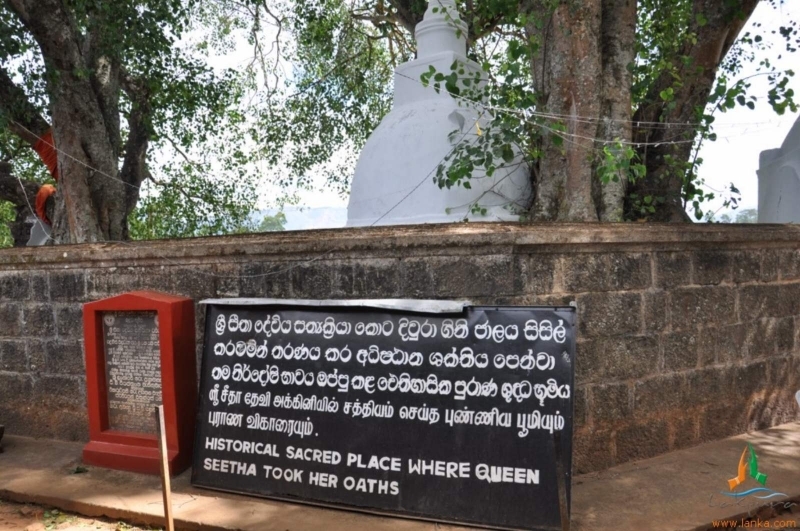 This place is now called Sita Kotuwa which means ‘Sita’s Fort’ and got its name because of Sitadevi’s stay here. 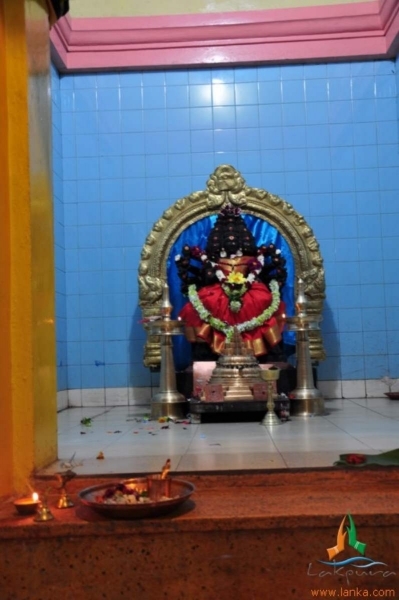 Gayathri peedam is believed to be the place from where King Ravana’s son Meghanath propitiated Lord Shiva with penance and pooja’s and in turn was granted super natural powers by Lord Shiva. 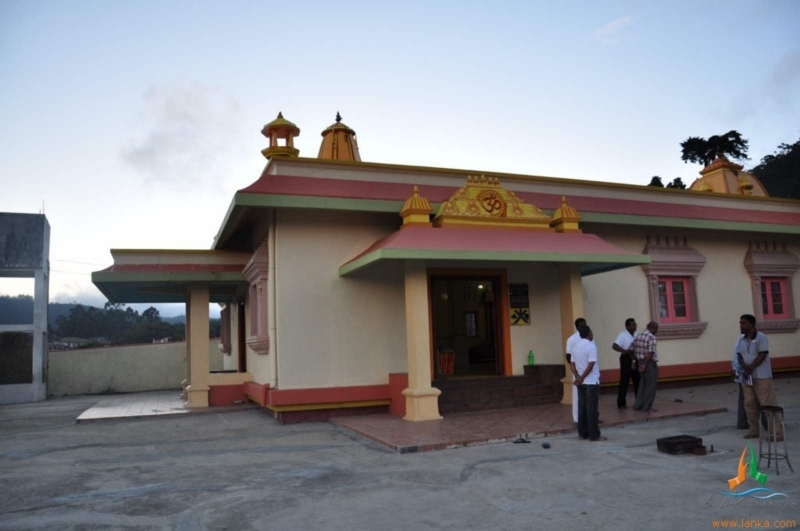 Sri Baktha Hanuman Temple,Ramboda Sri Baktha Hanuman Temple,Ramboda On these hills of Ramboda where Hanuman was searching for Setadevi, Chinmaya mission of Sri Lanka built a temple with Hanuman as the presiding deity. 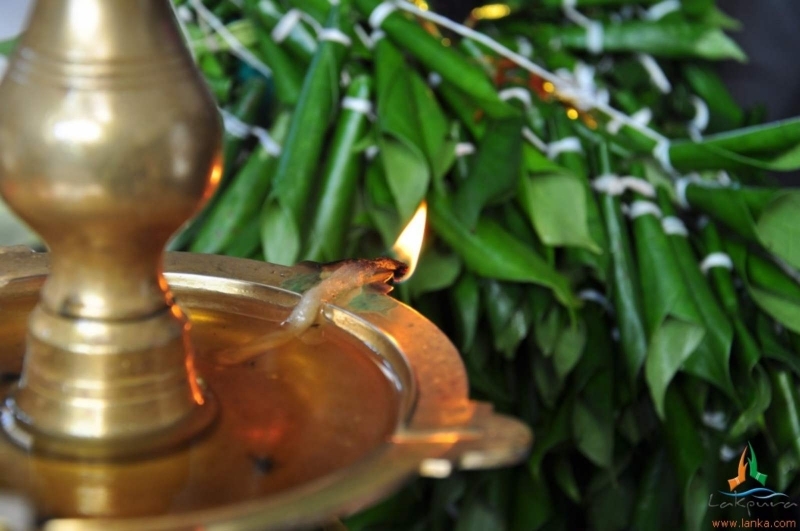 On every full moon day special pooja”s are conducted and witnessed by thousands of devotees. 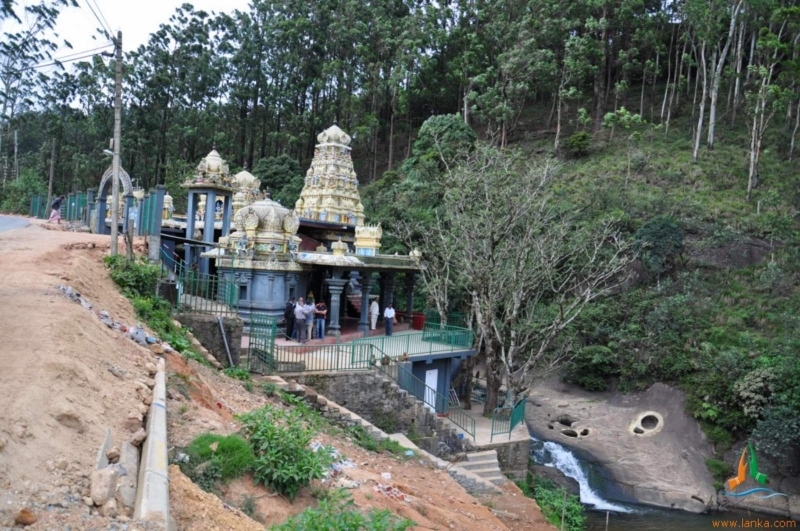 The stream that runs from the hill, catered to the needs of Sitadevi during her stay at Ashok Vatika. She is said to have bathed in this stream. 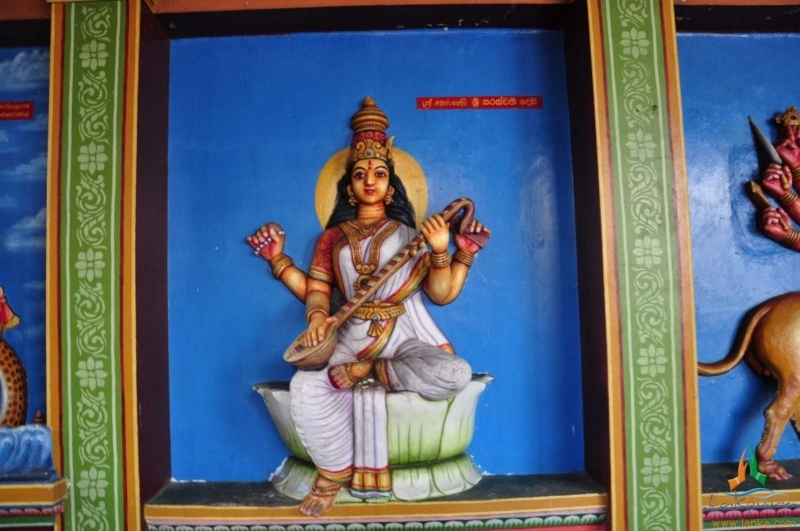 About a century ago of three idols were discovered in the stream, one of which was that of Sita. 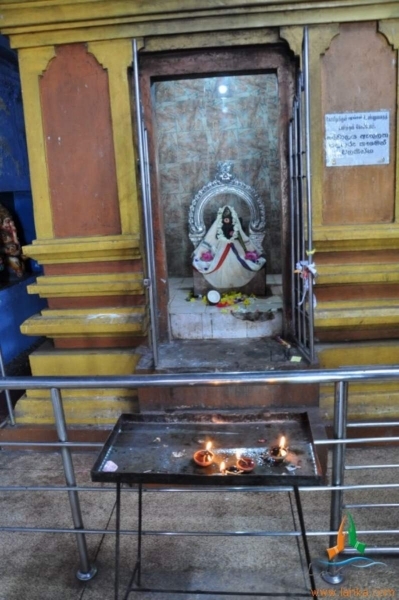 It is believed that the idols have been worshipped at this spot for centuries. 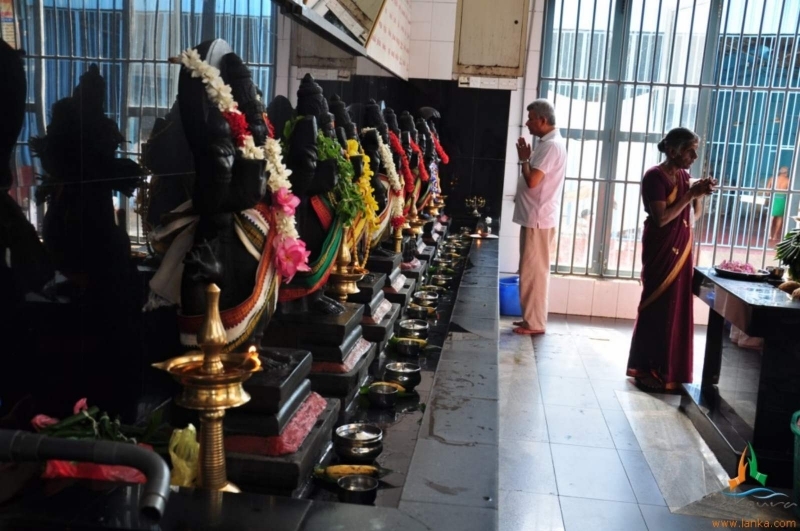 Now there is temple for Lord Rama, Sitadevi, Luxshmana, and Hanuman by the side of this stream. 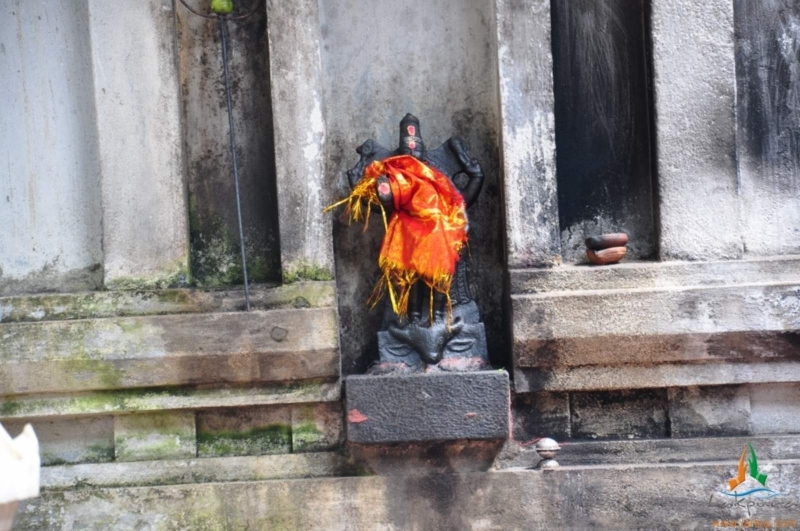 It is interesting to note that foot prints akin to Lord Hanuman’s are found by this river and some are of small size and some are of large size, which tells us of the immense powers of hanuman transforming himself into any size. 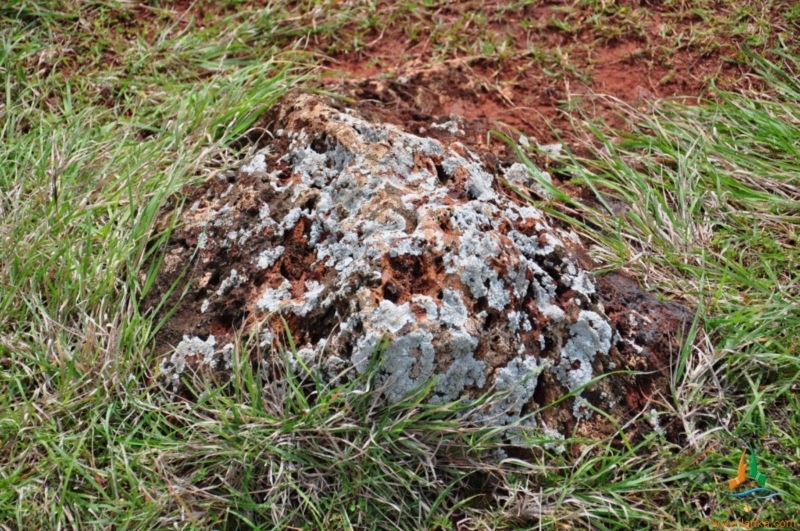 This is a rock in the Labookelle estate. 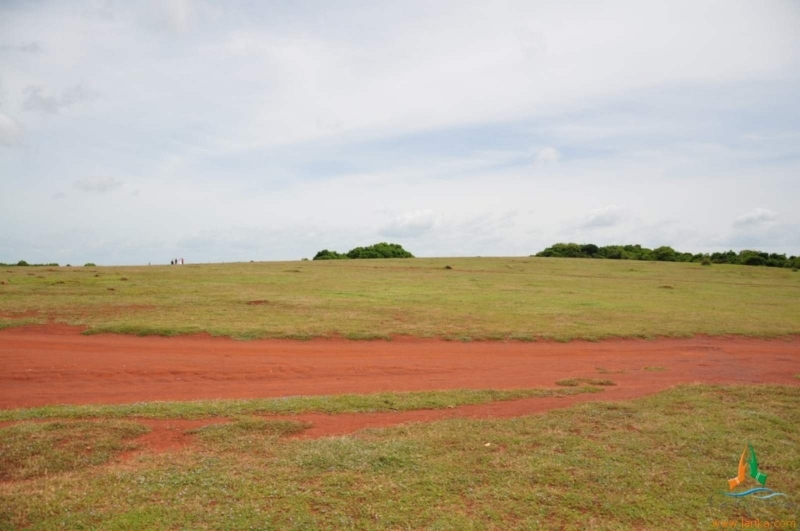 Lord Hanuman met Sitadevi and on his way to announce this happy information to Lord Rama, rested on this hill top. 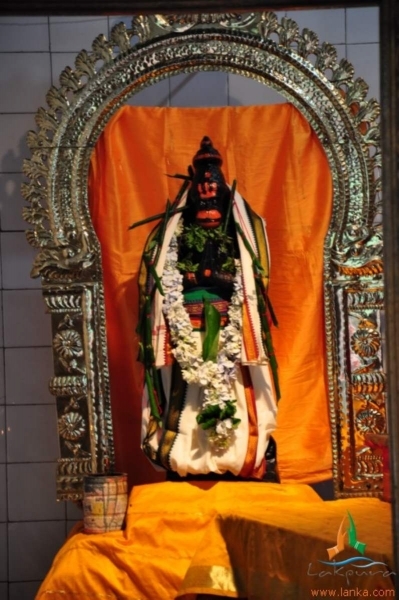 The hilltop where Lord Hanuman is believed to have rested after meeting Sitadevi is known as Mani Kattuther. 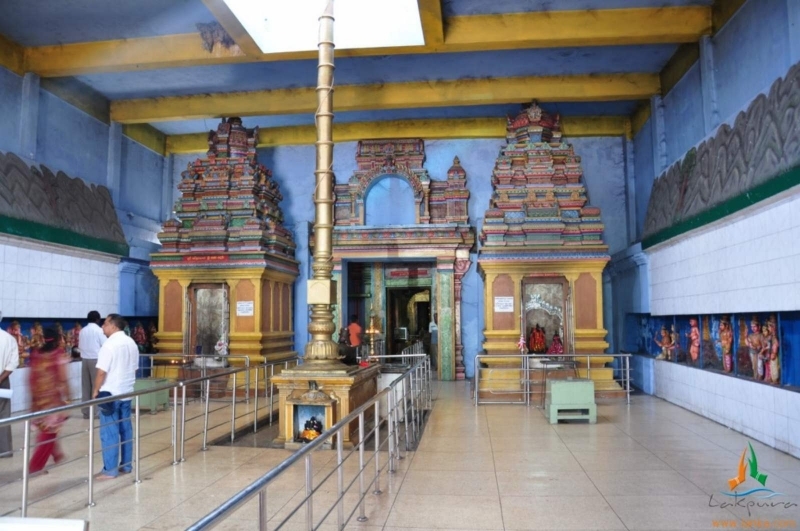 Today an open temple with statues of Lord Rama , Sitadevi, Lakshmana and Lord hanuman stands on top of it . 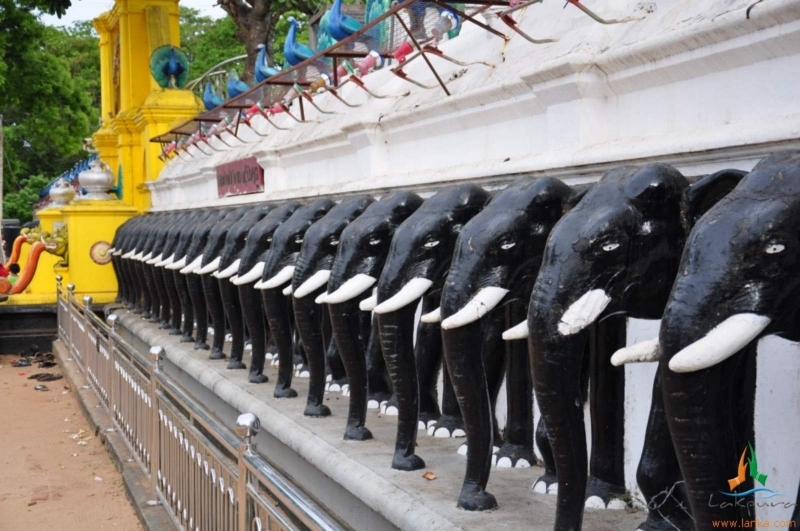 Locals visit the temple often. 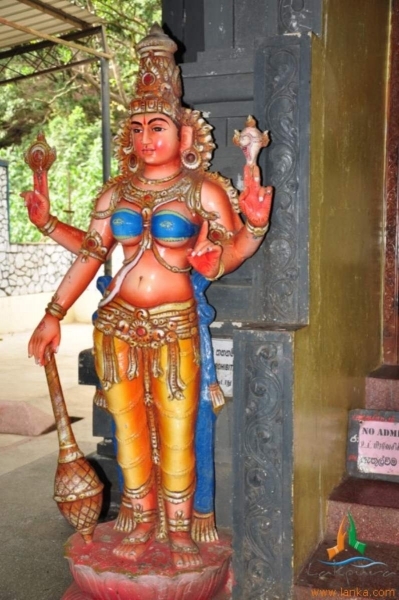 When King Ravana carried Sitadevi on his chariot to Ashoka Vatika, he provided her with vitaminised rice balls for refreshment. 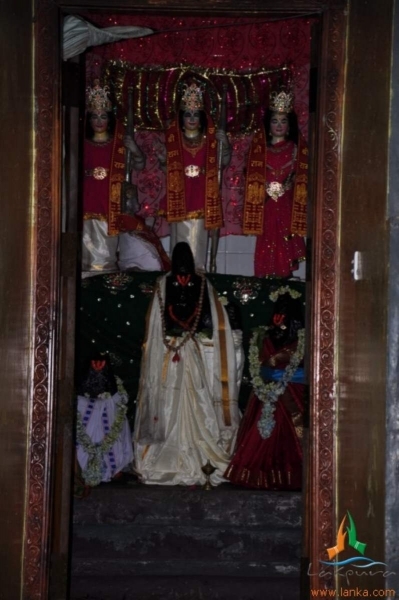 But Sitadevi who did not want to consume anything provided by King Ravana, scattered the rice balls all over the place during her journey, and they are found till date along the chariot track. 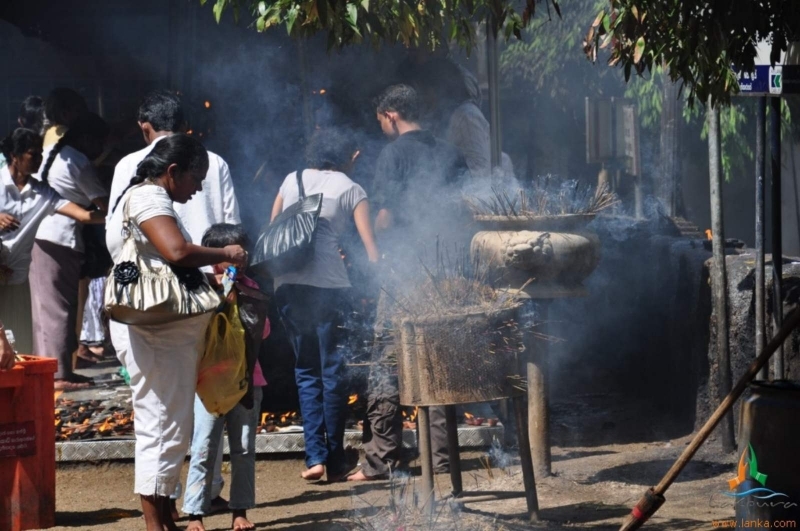 The local people call these rice balls Sita Gooli and they prescribe them for their children as a cure for stomach disorders and headaches. The farmers too keep them in their cash boxes or grain pots for prosperity. 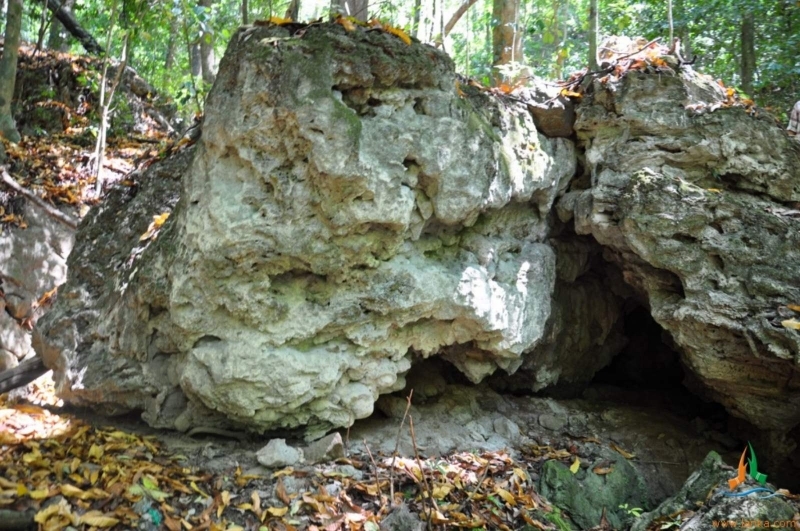 It is claimed that carbon dated testing has been done in Tokyo and Delhi on these rice balls and ascertained to be more than five thousand years old. 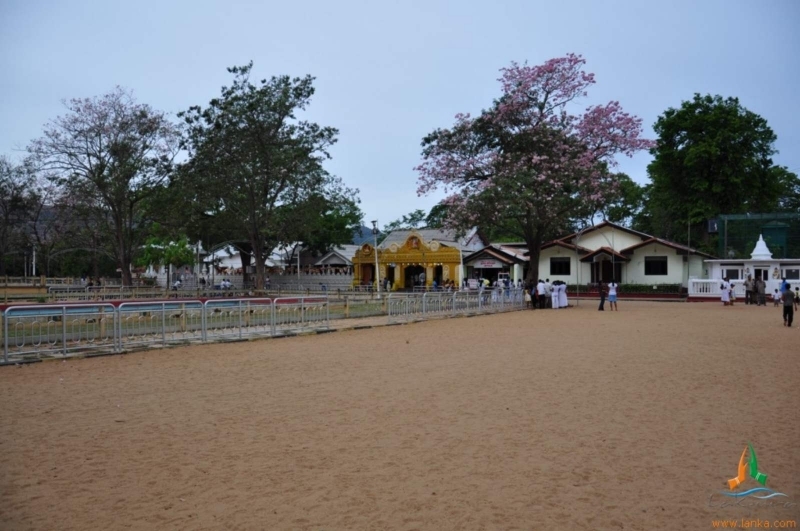 Divurumpola means a ‘place of oath’. 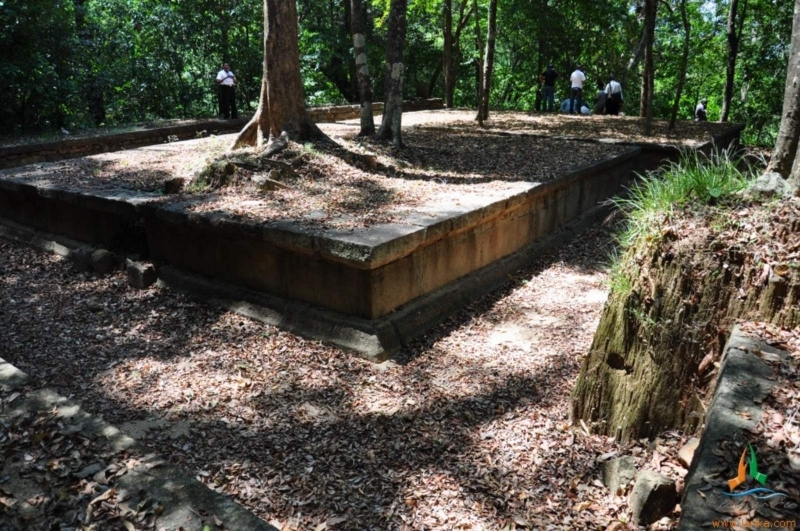 This is the place where Sita underwent the “Agni” test. She came unscathed and proved her innocence and purity. Sita was shocked. “You have broken my heart” she said,”only the uncultured speak like this”. Have you forgotten the noble family I come from? 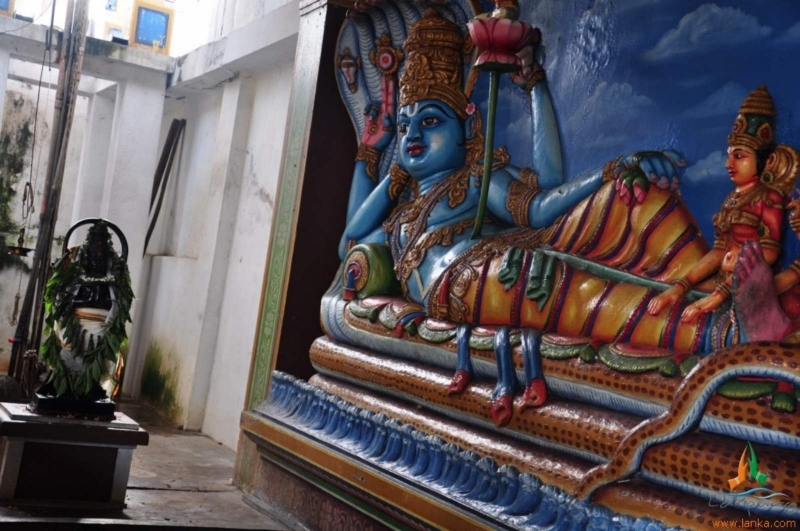 Is it my fault Ravana carried me off by force? All the time, my mind, my heart, and soul were fixed on you alone, my lord! 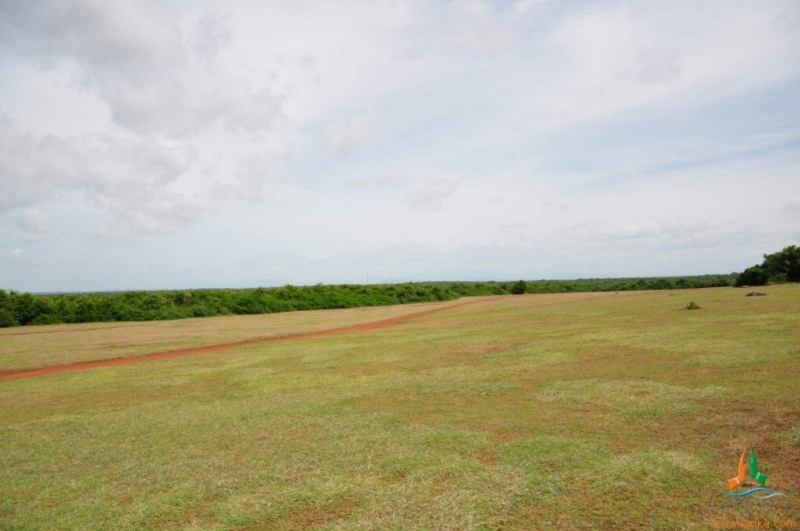 The spot was initially fenced and walled to protect it from surrounding wilderness. 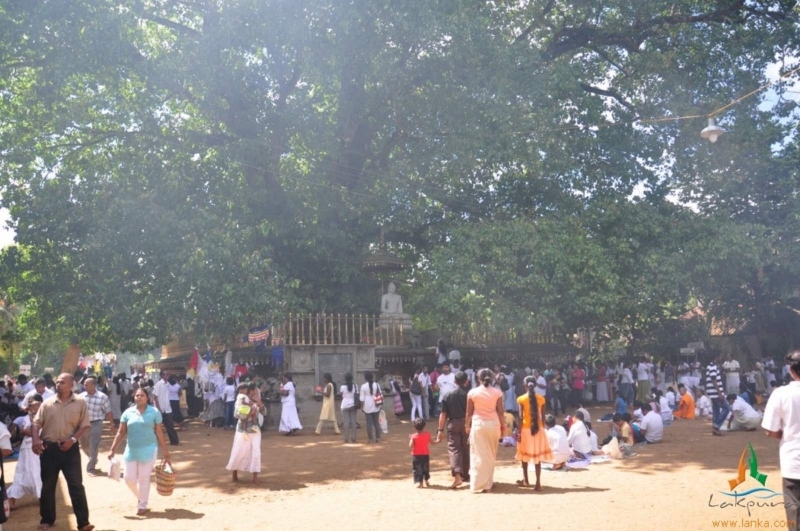 Then a sapling of the Anuradhapura bodhi tree (one of the 30 original saplings) was planted as a mark of respect of the place. 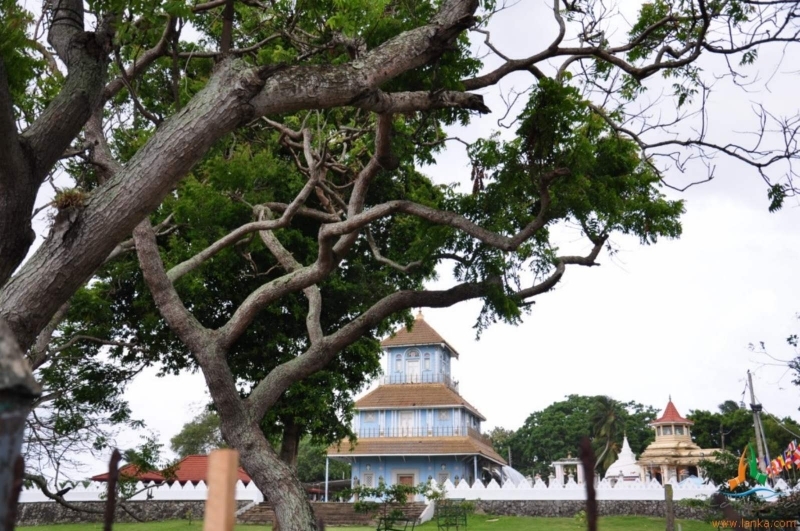 A small dagoba was built subsequently under the Bodhi tree. 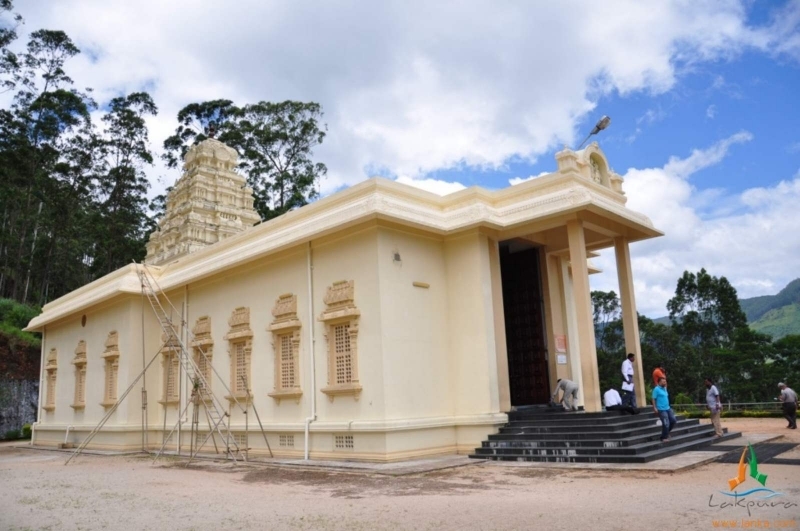 The temple depicts paintings of the Ramayana epic. 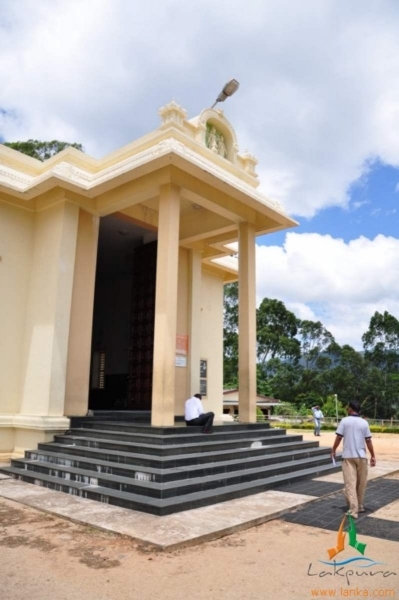 Today the temple is revered for the oath taken by Sitadevi and even the legal system permits and accepts the swearing done at this temple while settling disputes between parties. 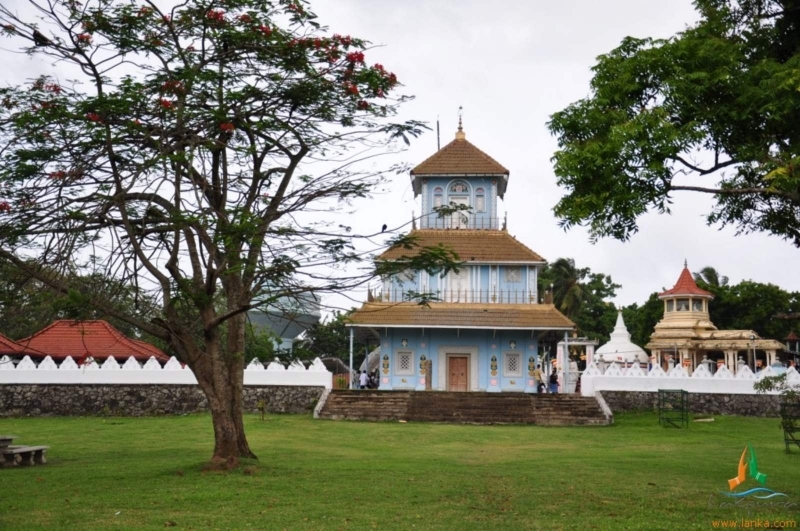 Ishtripura means an area of women in Sinhalese. 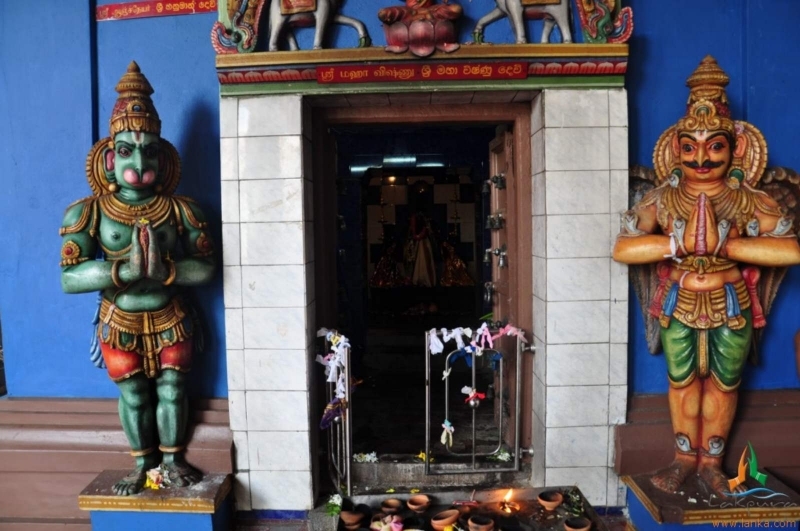 This was one of the places to which King Ravana shifted Sitadevi as a precautionary measure which he was forced to take by Lord Hanuman’s advent. 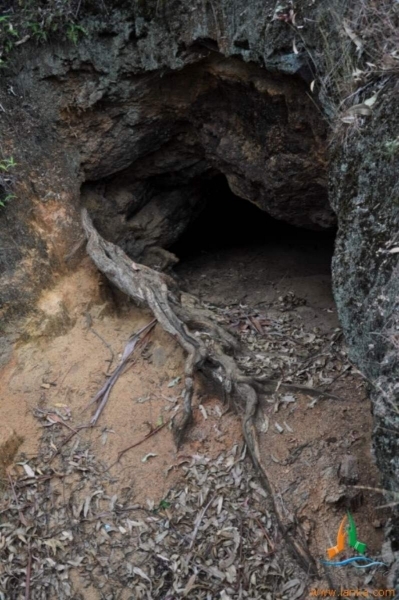 There are lots of intruding tunnels and caves in this area. 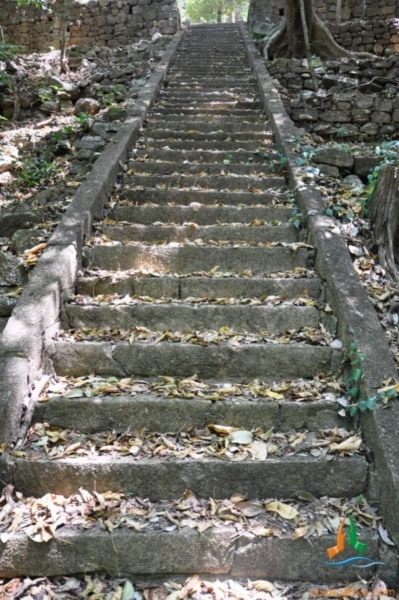 This seems to be a part of a great ingenious network of paths, which is interconnected to all the major areas of King Ravana’s city. 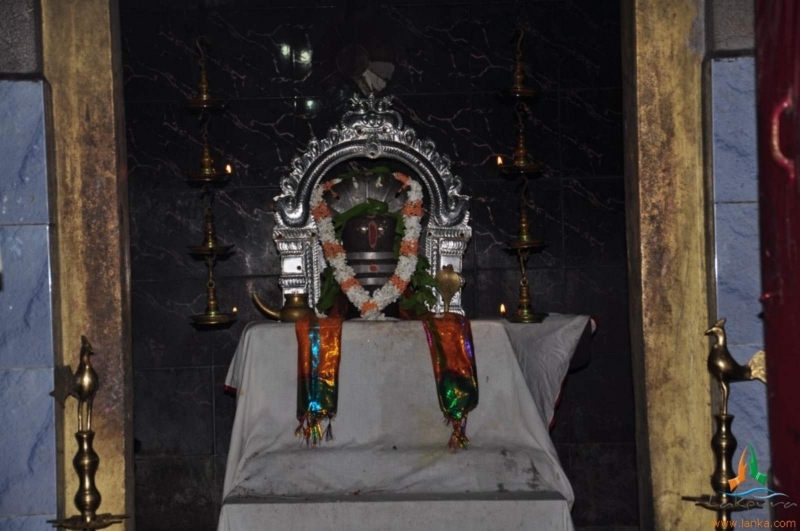 Sitadevi took bath in this very stream and had dried her hair sitting on a rock and put clips to her hair,hence this rock is known as Konda Kattu Gala. 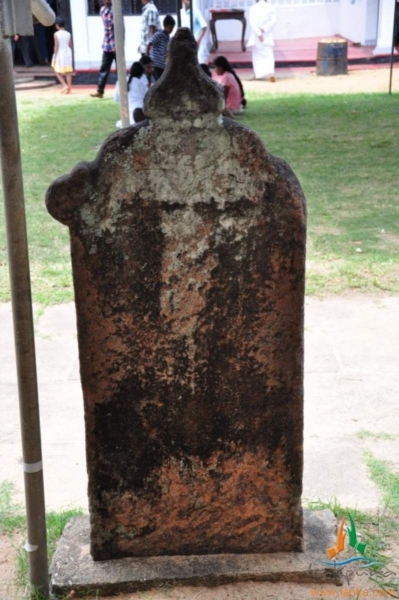 This is situated in the Welimada Area. 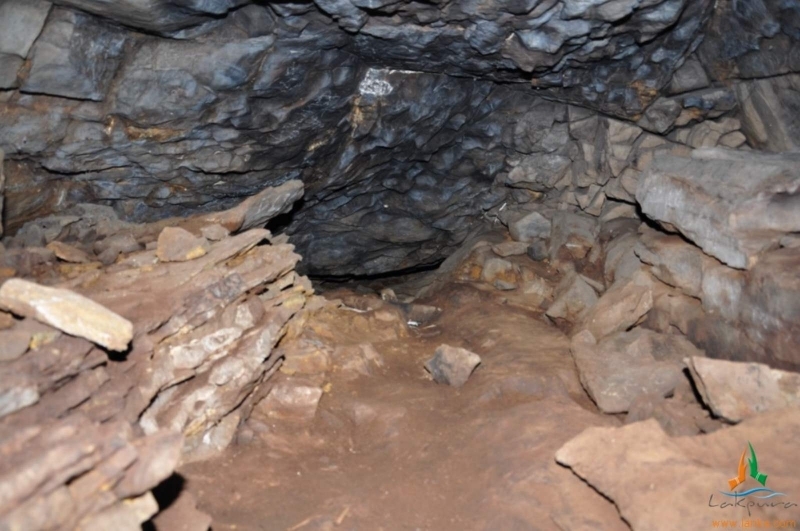 These tunnels prove beyond doubt the architectural brilliance of King Ravana. 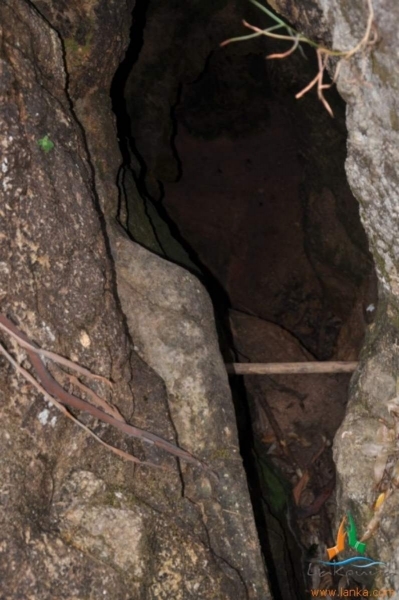 These tunnels served as a quick means of transport through the hills and also as a secret passage and networked all the important cities, airports and dairy farms. 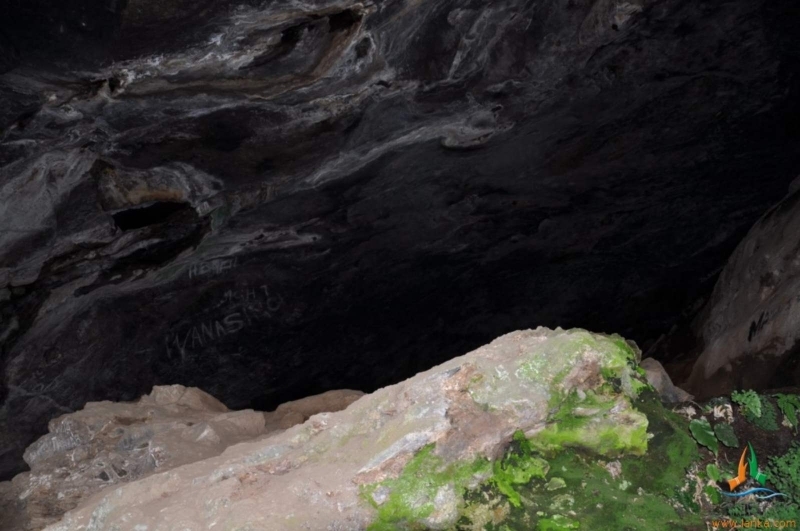 A .close look at these tunnels indicates that they are man-made and not natural formations. 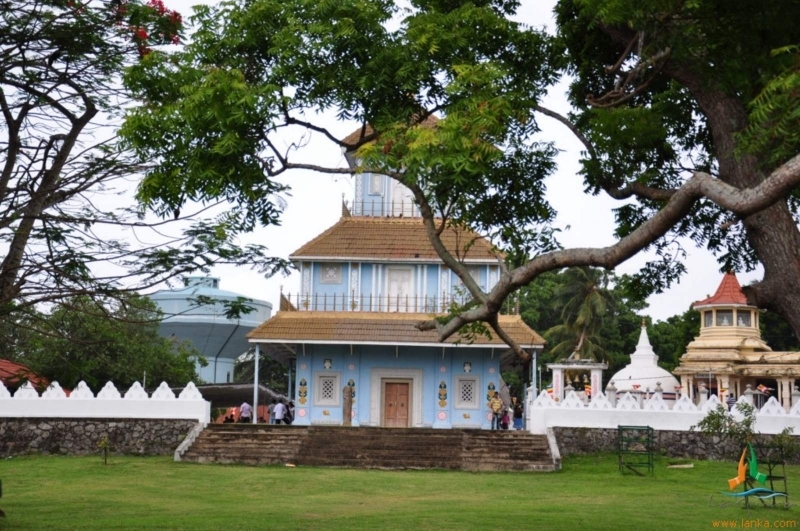 This Buddhist shrine at Kalutara was where once King Ravana’s palace and a tunnel existed. 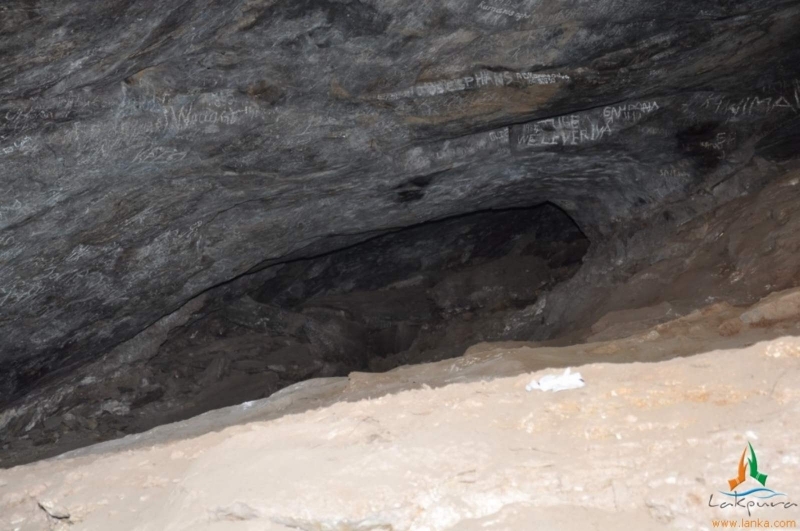 Existing tunnel mouths are situated – Isthripur at Welimada, Ravana cave at Bandarawela, Senapitiya at Halagala, Ramboda, Labookelle, Wariyapola/Matale, and Sitakotuwa/Hasalaka. 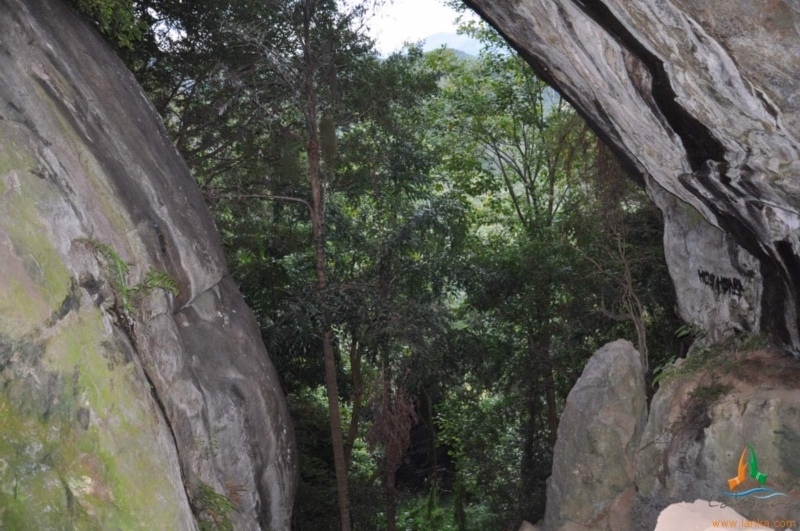 In addition there are many more tunnels. 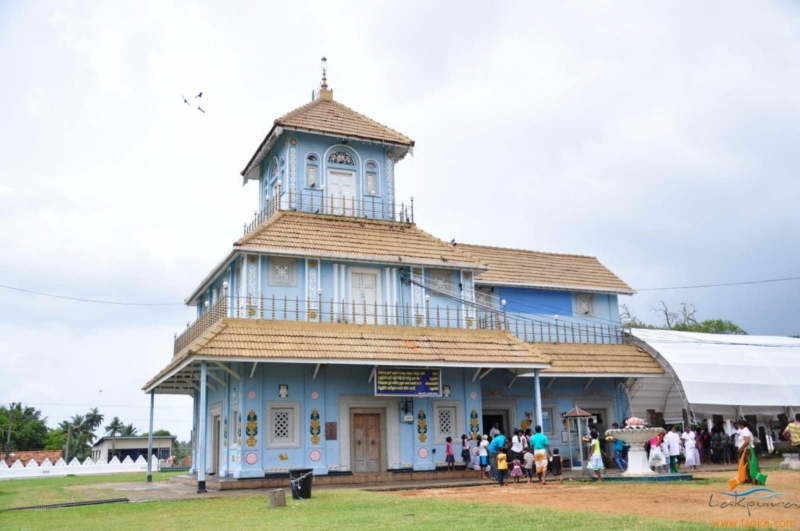 This is the temple of Lord Karthikeya Subramaniam at Kataragama. 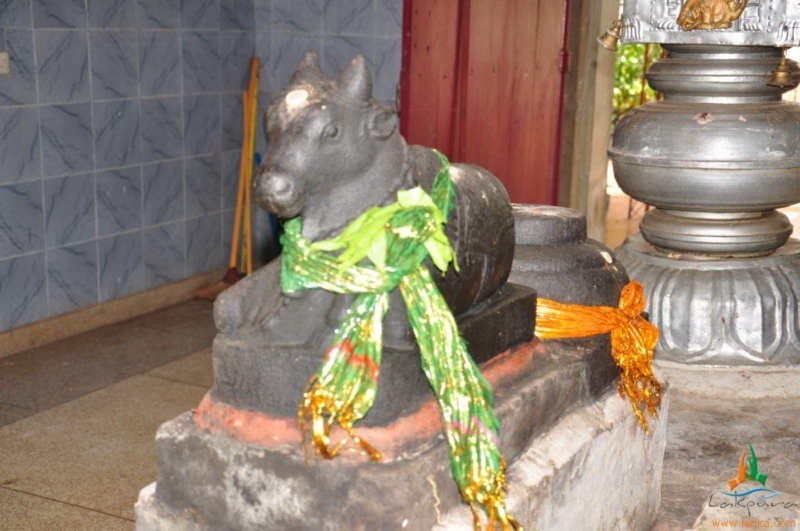 Lord Karthikeya was requested to go to the battlefield by Lord Indra on the last day of war. 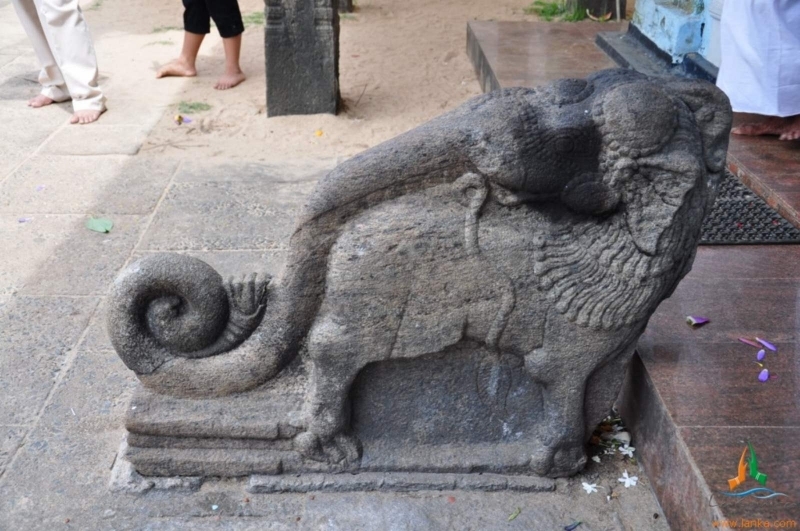 This was done to protect Lord Rama from the wrath of Brahmastra aimed by King Ravana which otherwise would have weakened Lord Rama. 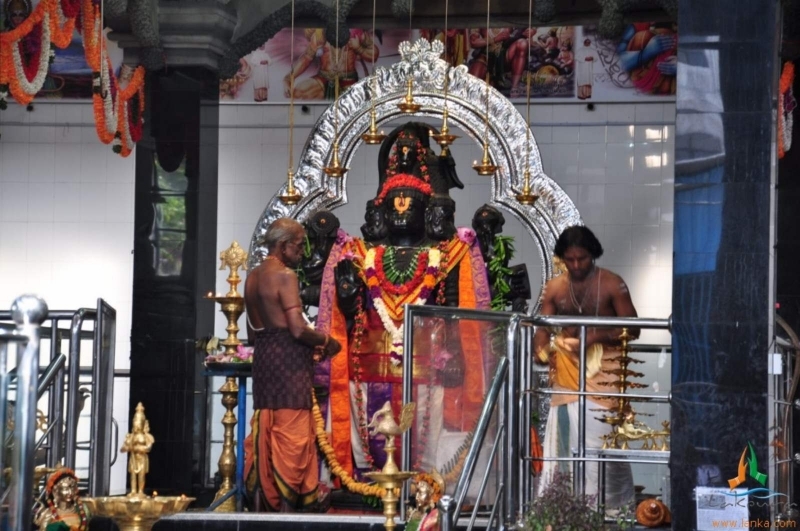 The benefit was one of the most powerful weapon brahma asthra aimed at Lord Rama for the second time was rendered useless by the presence of Lord Karthikeya. 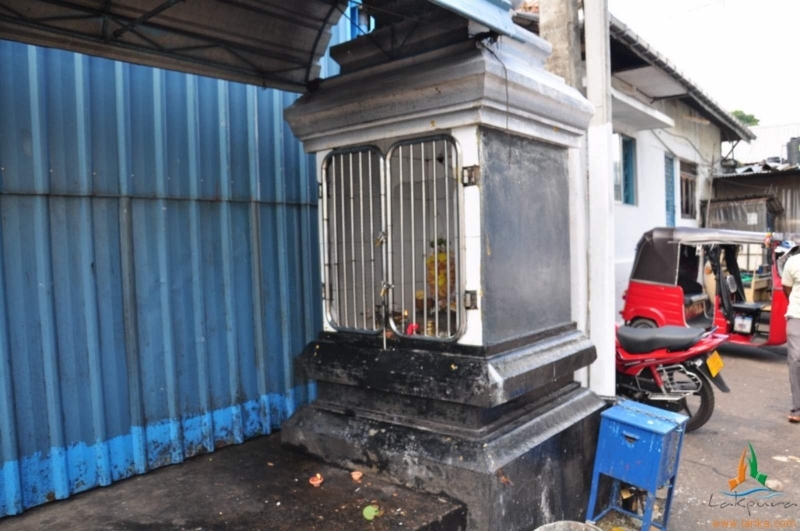 According to Ramayana, after meeting Sitadevi Lord Hanuman dedicated to test the strength of the mighty King Ravana and his army of Rakshasas. 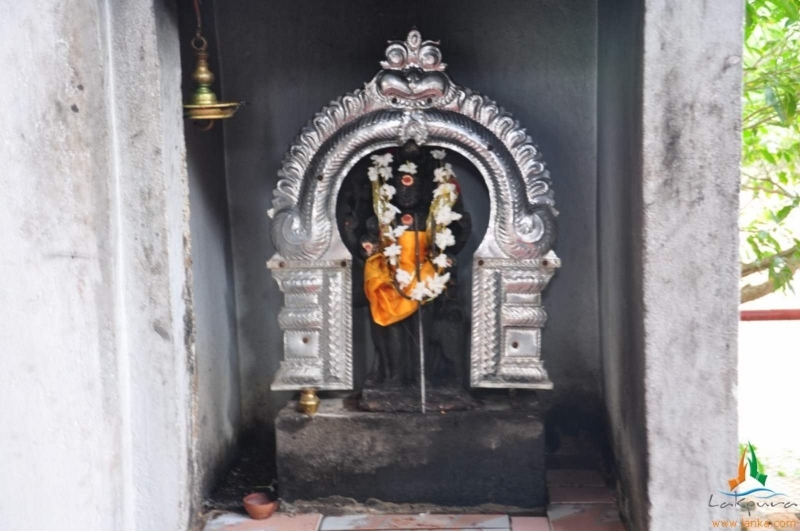 In the events that unfolded Lord Hanuman’s tail was set on fire by the rakshasa’s, who in turn went on to torch some parts of King Ravana’s empire. 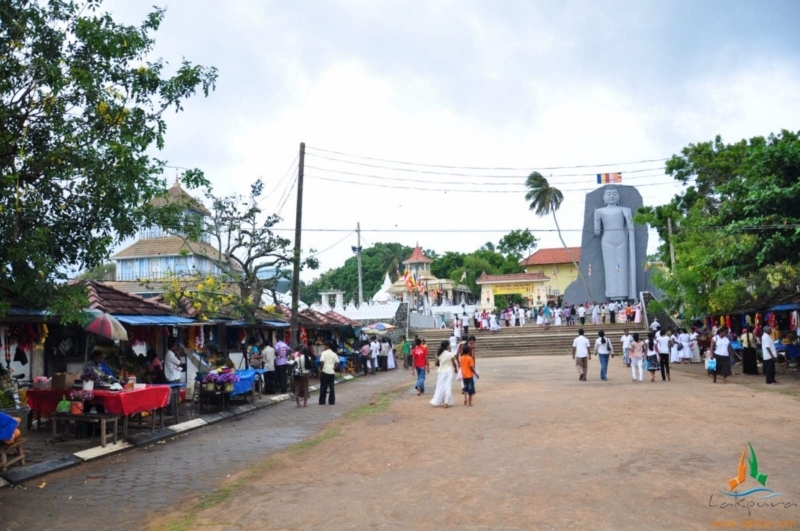 Ussangoda is one of the torched areas, which is said to have been a airport used by king Ravana. 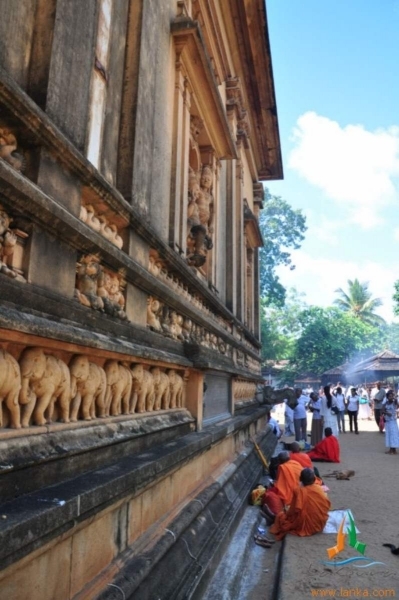 Weragantota, means ‘a place of aircraft landing’ in Sinhala language, is believed to be the first place where Sitadevi was brought into Lanka in King Ravana’s Vimana. 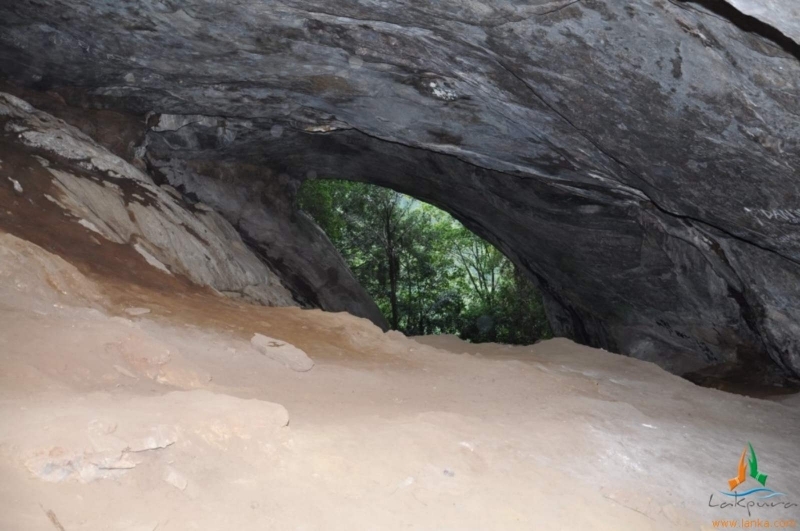 These jungles are the place where the city of Lankapura once stood .The city had a beautiful palace for queen Mandothari surrounded by waterfalls, streams and varieties of flora and fauna. 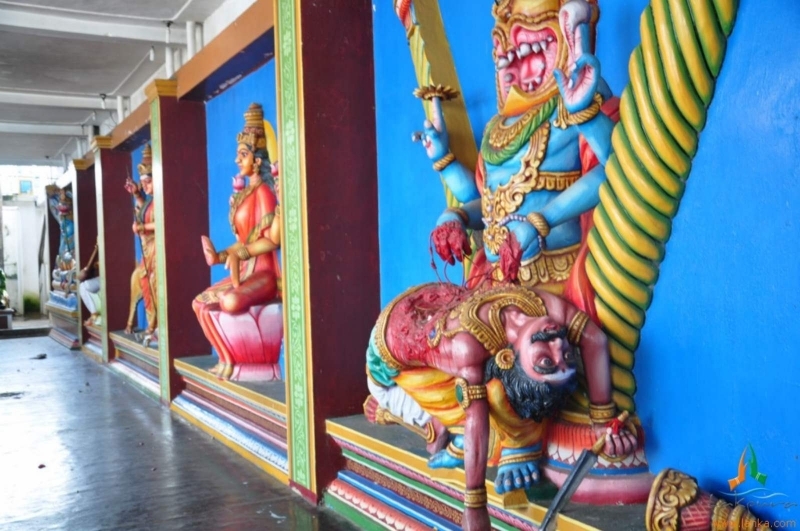 These are the places from where Sugreeva king of the Vanara’s started his onslaught on king Ravana’s force. 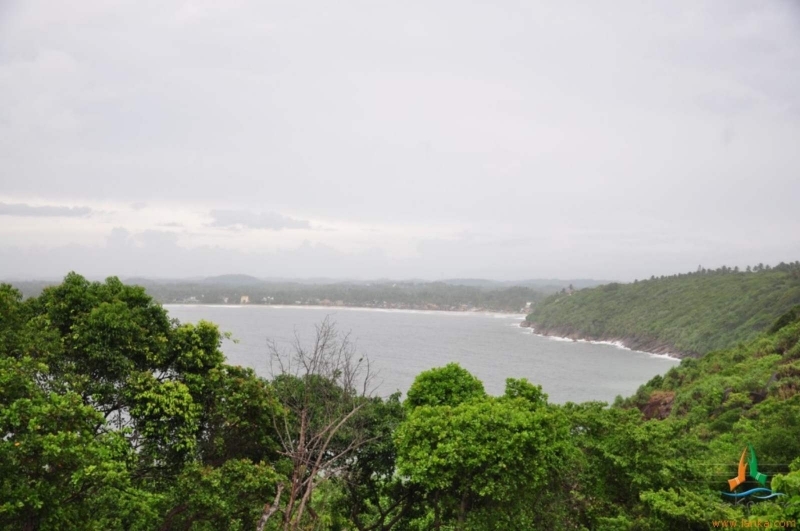 The summit of the mountain next to the mountain range overlooking Frotoft Estate in Pussallawa is the place where Lord Hanuman first set his foot on mainland Lanka. 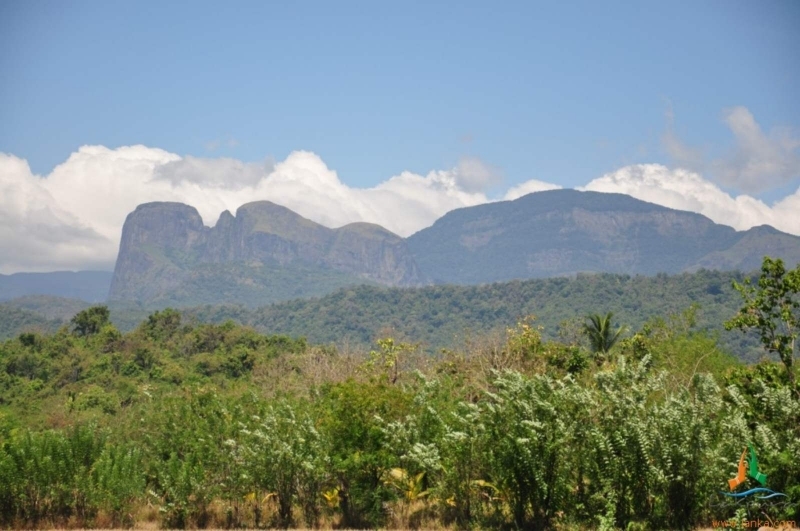 This mountain known as Pawala Malai is visible from this mountain range. 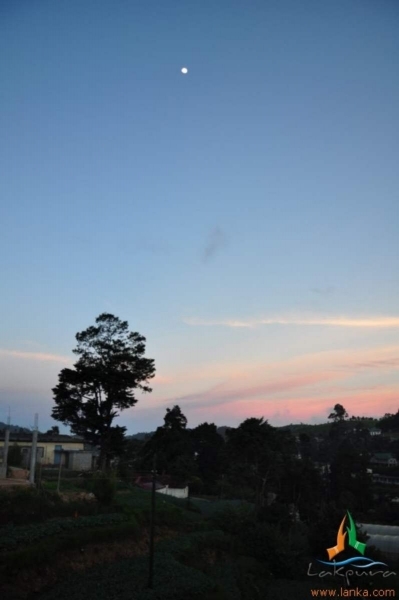 These hills stand tall in-between King Ravana’s capital city and Ashoka Vatika. 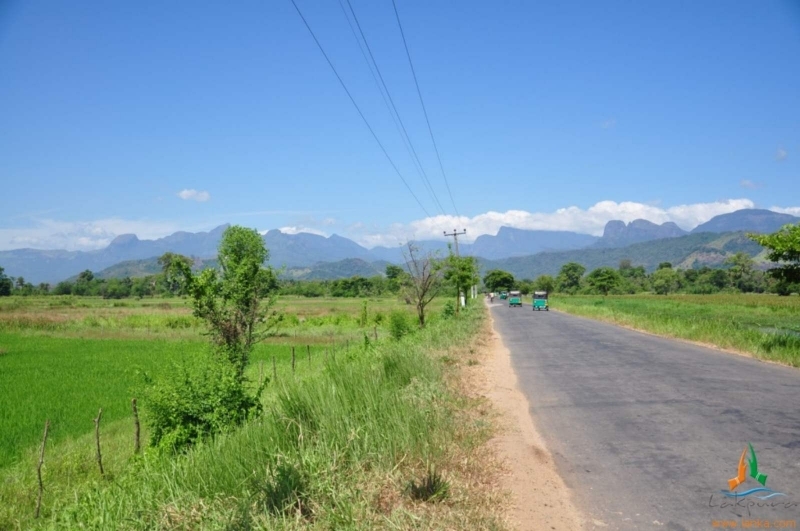 The barren land atop themountain range is believed to be the route in which King Ravana took Sitadevi from his capital city Lankapura to Ashoka Vatika, which was a paradise on earth. Till date no vegetation grows on this passage except grass. 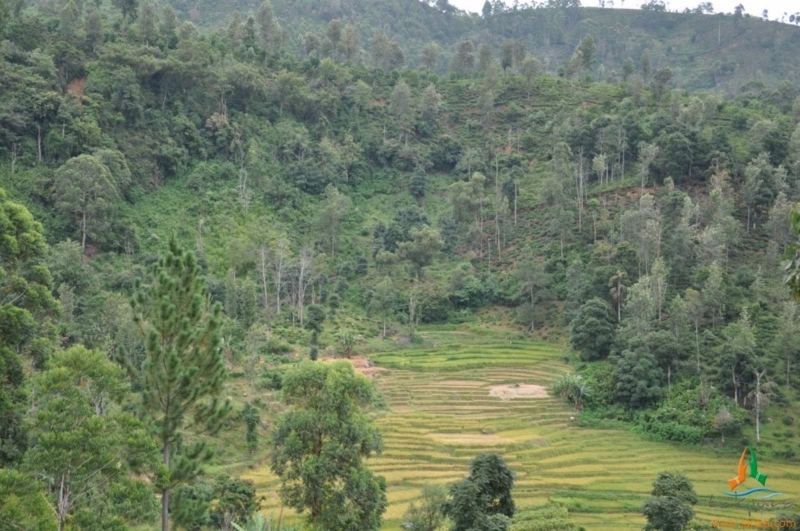 King Ravana is believed to have taken this passage on top of these hills to show Sitadevi the beauty of his kingdom. 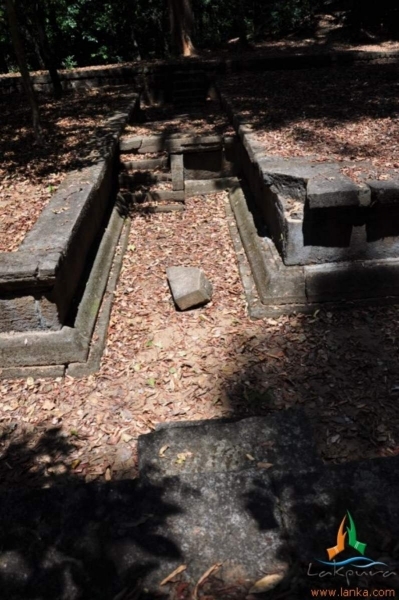 The Sita tear pond is found en route by the chariot route, is believed to have been formed by the tears of Sitadevi and has not dried up since, even during severe droughts when the adjoining rivers dry up. 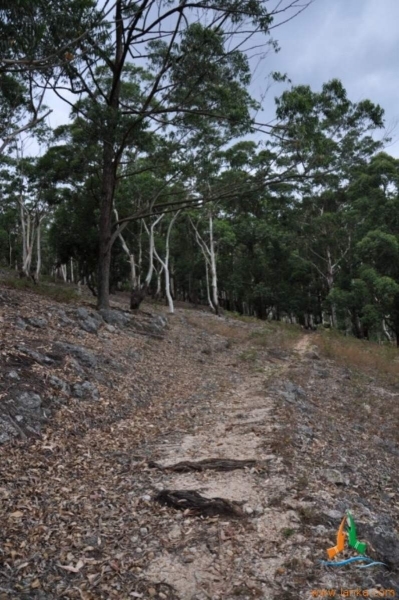 In this area there are many large trees whose bright red blooms add colour to the scenery. These flowers are called Sita flowers. The peculiarity of these flowers is the configuration of the petal’s, stamen and pistil’s, which resemble a human figure carrying a bow, and is said to represent Lord Rama. 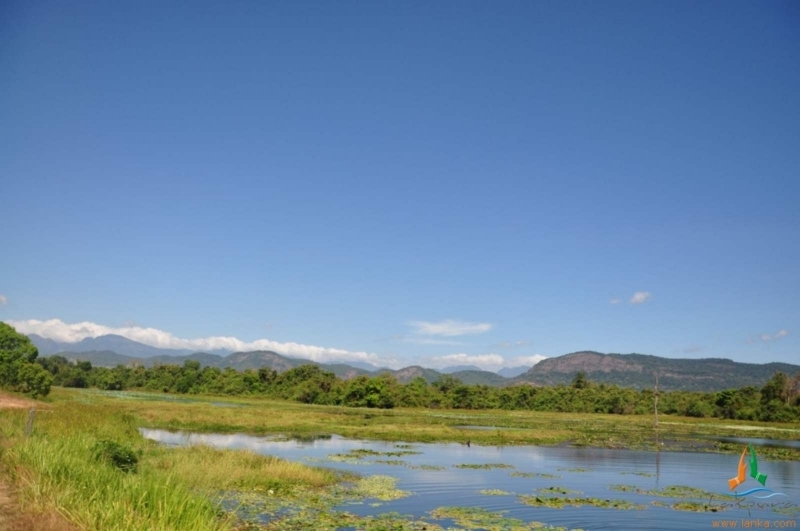 These flowers are unique only to this area in the whole of Sri Lanka. 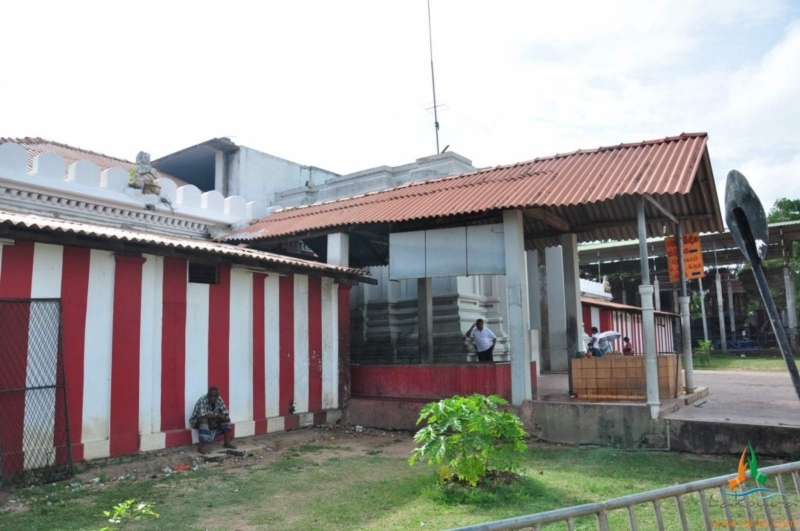 There was an aircraft repair center in the capital city. 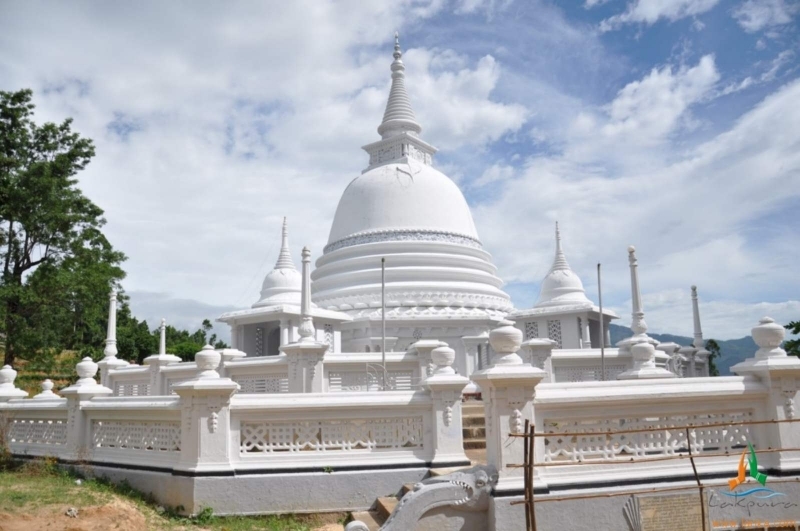 This place is known as Gurulupotha. 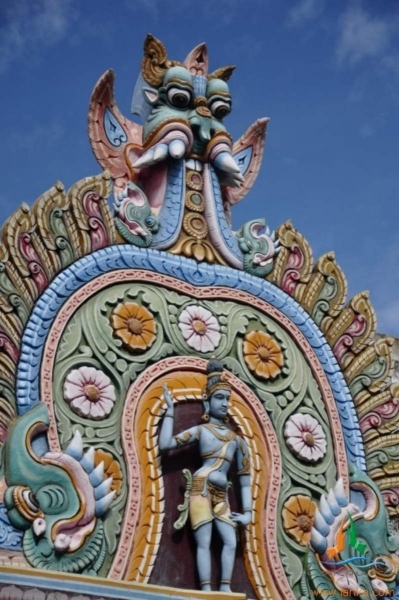 In Valmiki’s depiction King Ravana’s Vimana resembled a huge peacock. 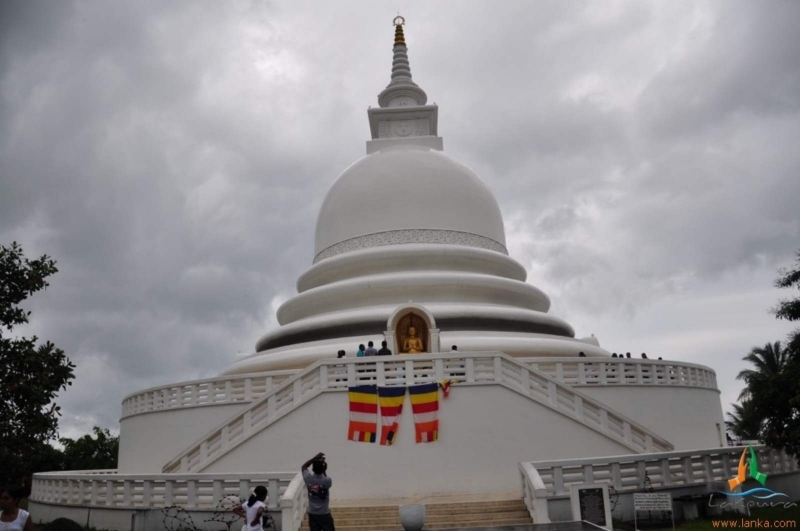 The Vimana in Sinhala language means Dhandu Monara which is known as ‘flying peacock’, and hence the name Gurulupotha, which means ‘parts of birds’. 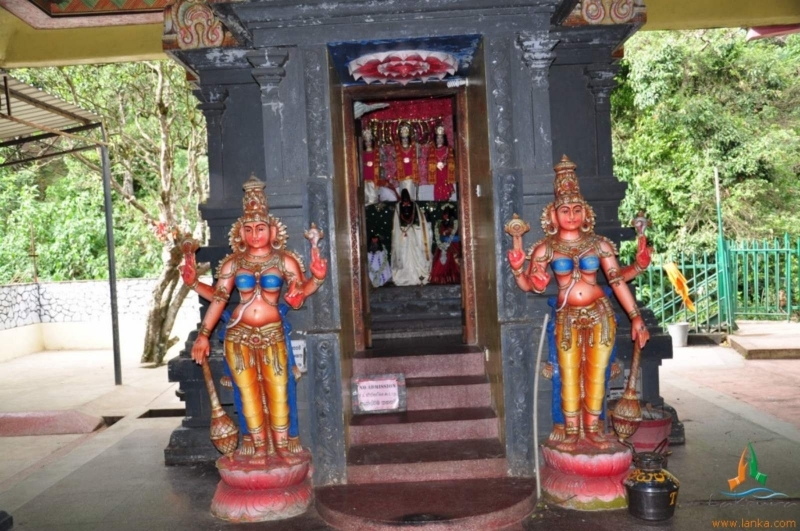 It is a place where Sitadevi stayed during her transit. 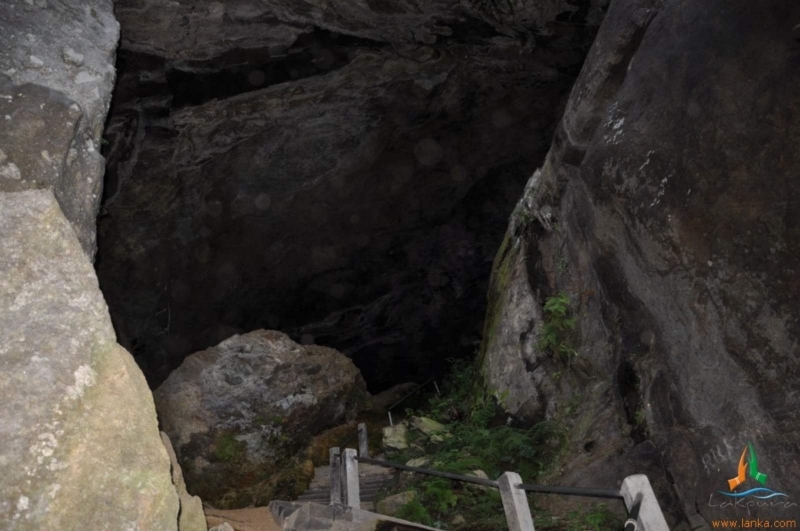 This area is also linked with tunnels and caves, which runs through to other parts of King Ravana’s kingdom. 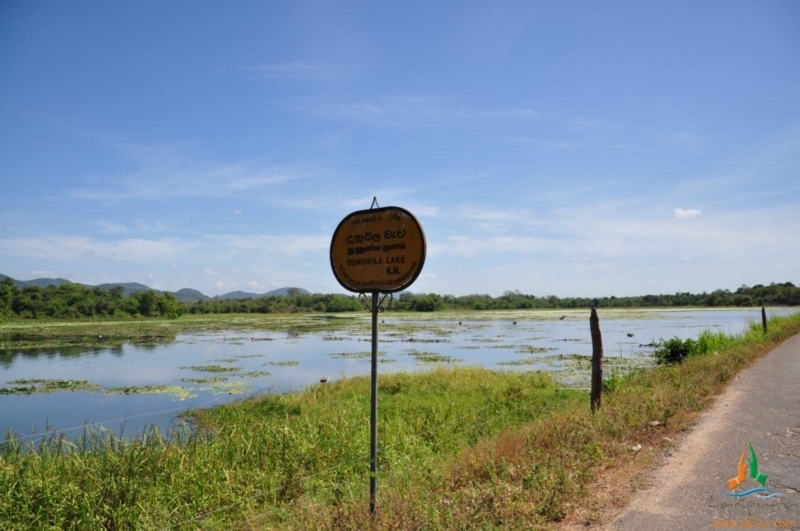 This is situated in the Kotmala area opposite to Ramboda rock. 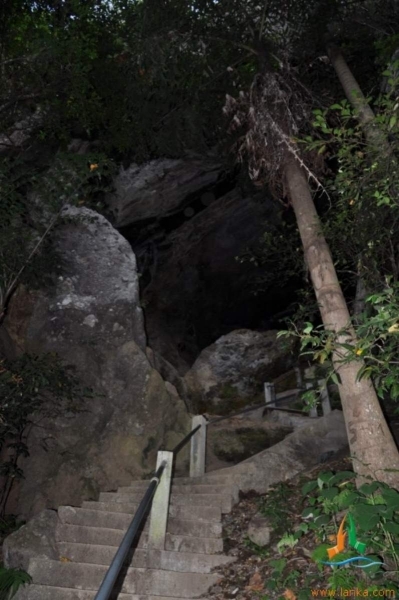 The main cave entrance was closed by an earth-slip in 1947. 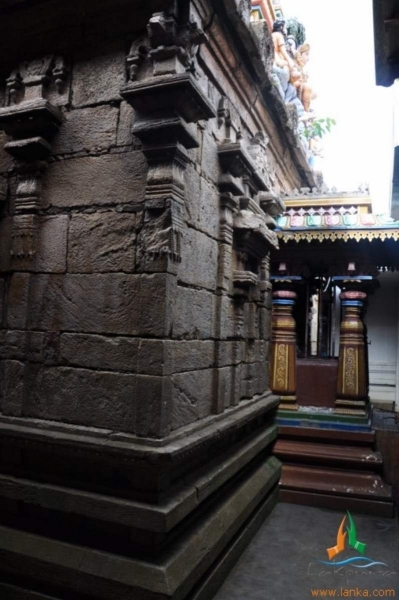 Locals believe this part of the complex was used as a prison by Ravana. 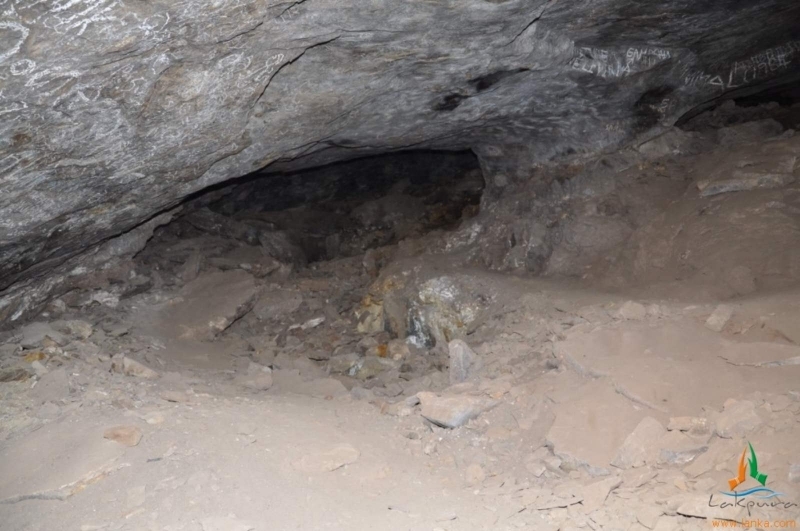 The cave complex has not been fully explored.